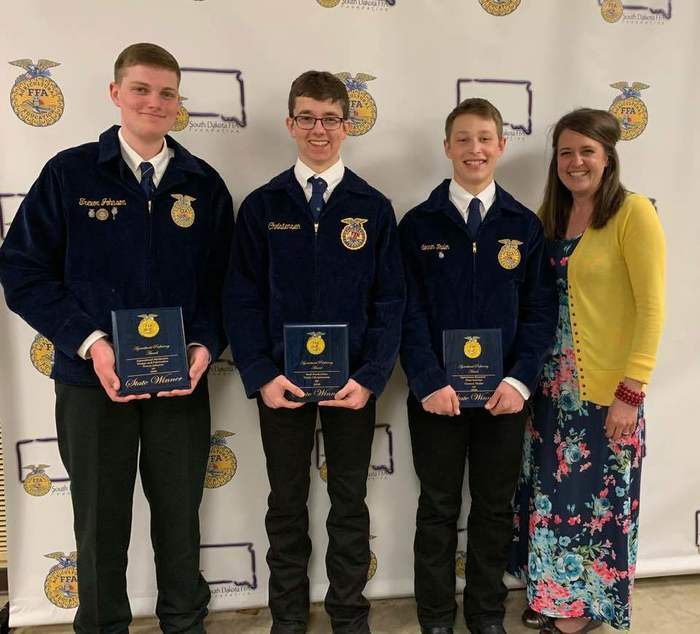 The Beresford High School FFA Chapter received 1st place in the National FFA Chapter Award in Growing Leaders and Strengthening Agriculture. They received 3rd place in Building Communities and 2nd place overall at State! 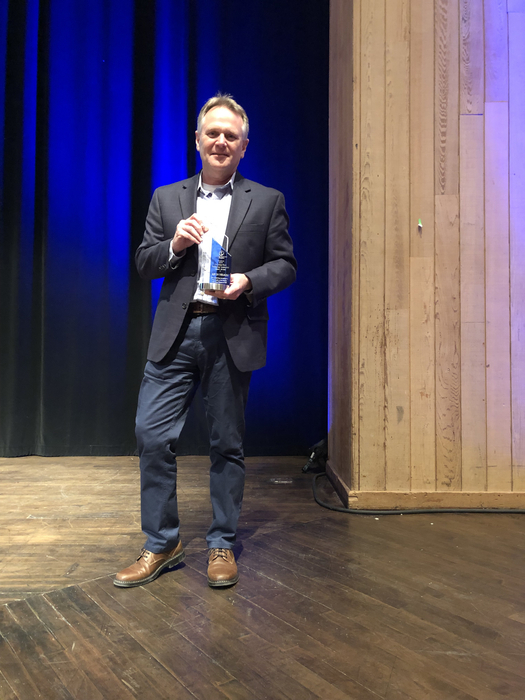 Congratulations on an outstanding year! 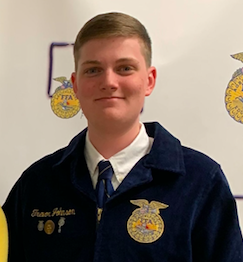 Congratulations to Trevor Johnson on winning the State Livestock Judging, State Ag Mechanics, and State Fabrication Proficiency Contests at the State FFA Convention! Trevor also placed 2nd in Diversified Ag, 3rd in Forage Production, and 3rd in Beef Placement! Due to the freezing rain, wind gusts that are predicted, and road conditions, there will be no school in the District today, Thursday, April 11. All school activities and practices for today have been cancelled. 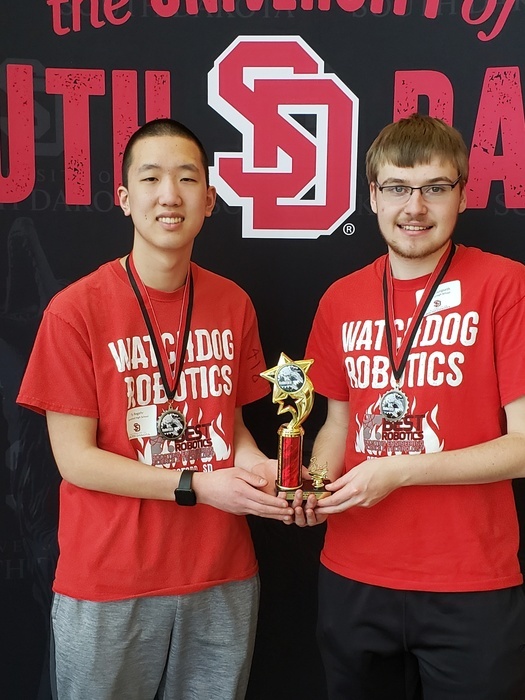 Congratulations to Ty Regehr and Casey Klungseth who placed third at the "Battle of the Bots" at USD! Their task was to program a robot to accomplish a maze that changes. Casey is a senior and Ty is a sophomore at BHS. Both are active members of Watchdog Robotics. 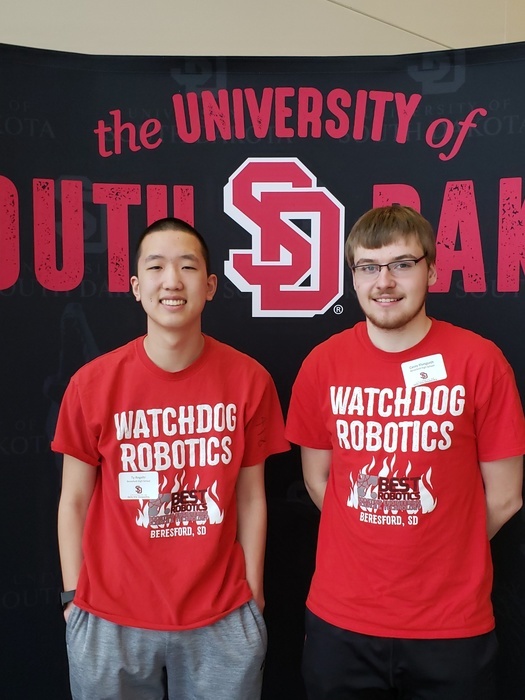 Good luck to Ty Regehr and Casey Klungseth today as they are competing at the University of South Dakota's Robotic Competition titled, "Battle of the Bots!" Congratulations to Conner Thaler for receiving the Blue n Gold Scholarship! 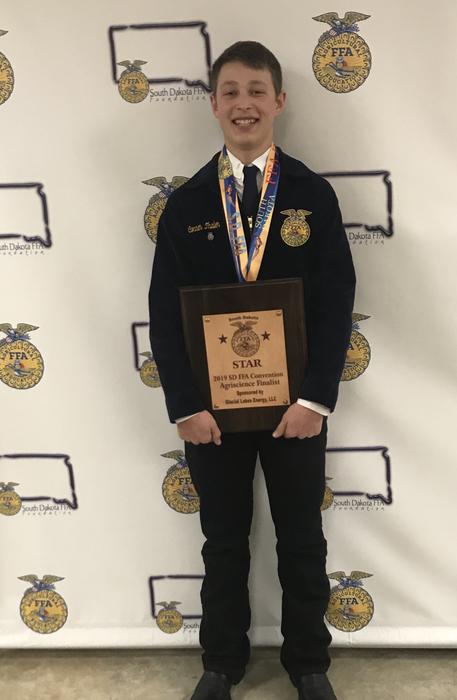 Conner Thaler was recognized as a finalist for Star in Agriscience. Congratulations Conner! 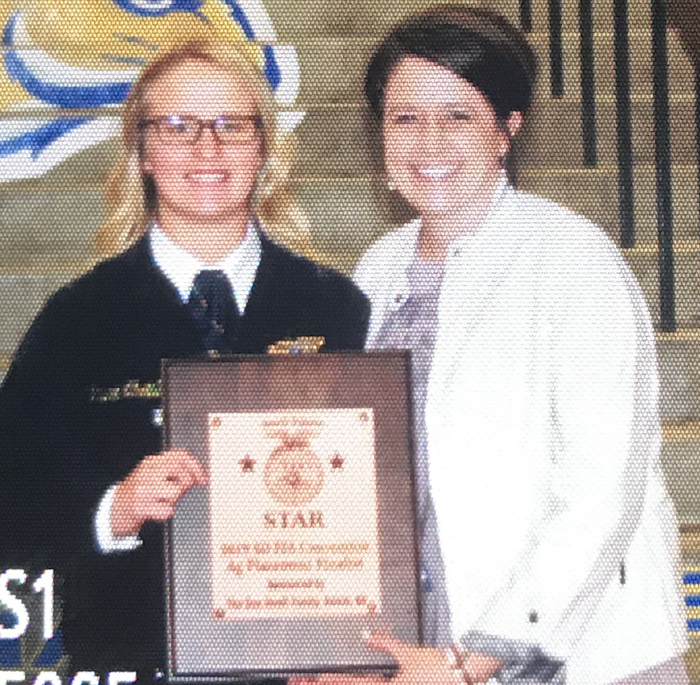 Kaysee Christensen was honored as a finalist for Star Ag Placement. Congratulations Kaysee! Congratulations to FFA Advisor Mrs Bridget Twedt for receiving her Honorary FFA Degree last night! 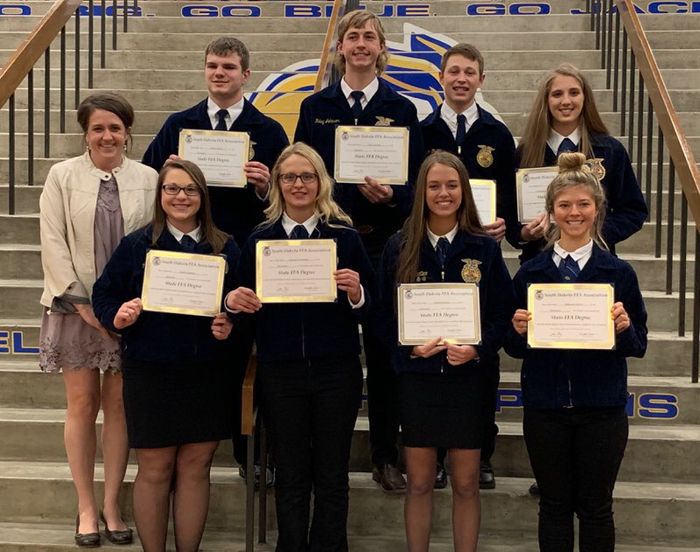 Congratulations to the following seniors for earning their State FFA Degrees! Rachel Watkins, Kaysee Christensen, MaKayla Nelson, Andrew Jensen, Riley Johnson, Conner Thaler, Faith Weiland and Grace Quartier. 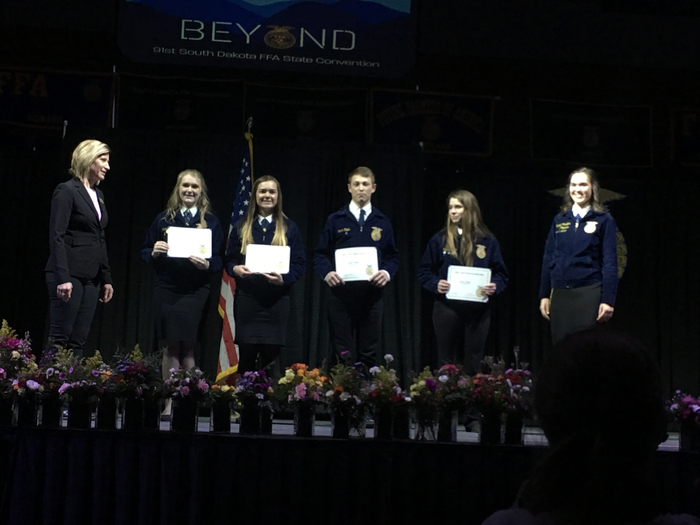 Congratulations to BHS FFA member Tate Johnson who placed third in Home & Community Development at the State FFA Convention in Brookings! Our BHS FFA Advisor is Mrs. Bridget Twedt. Congratulations to our BHS students at State FFA! Tyler Christensen won the Beef Placement Prof. and Trevor Johnson placed 3rd. Trevor won the Ag Mech. & Fabr. Prof., placed 2nd in Diversified Ag, and 3rd in Forage Prod. 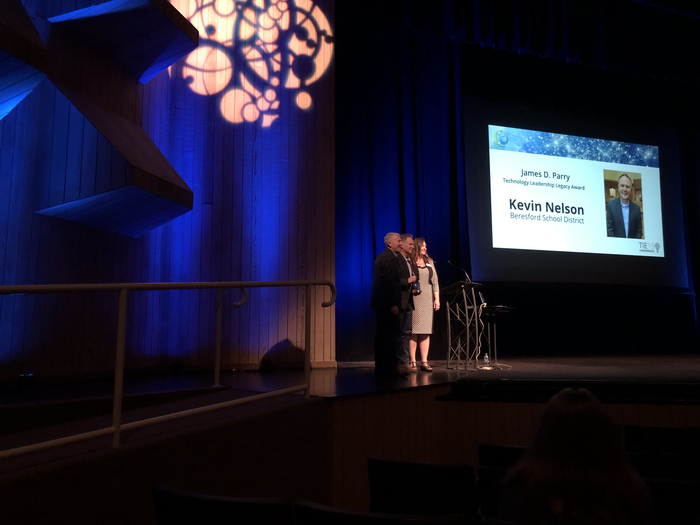 Conner Thaler won the Agriscience Plant Systems Prof.
Congratulations to Beresford Elementary School Principal Mr. Kevin Nelson who received the Dr. James D. Parry Technology Leadership Legacy Award for 2019 at tonight's TIE Conference in Rapid City! Due to the rain over the weekend, many of our township roads in the country are in tough shape. As a result, our buses will travel where possible and will be on paved roads for a lot of the routes this week. Our bus barn phone number is 763-5097. Due to the condition of our township roads, our buses will run primarily on paved roads this afternoon and tomorrow. Similar to the last time, arrangements will need to be made with our bus route drivers. Thank you for your cooperation until the road conditions improve. Congratulations to our BHS Vocal Music and Band students on receiving superior ratings at the Region I Large Group Music Contest yesterday! We are extremely proud of our fine arts students and the quality of our instrumental and vocal music programs! BHS Band and Vocal Music students competed today in the SDHSAA's Region I Large Group Music Contest in Vermillion! Both groups did a tremendous job representing our school and community! 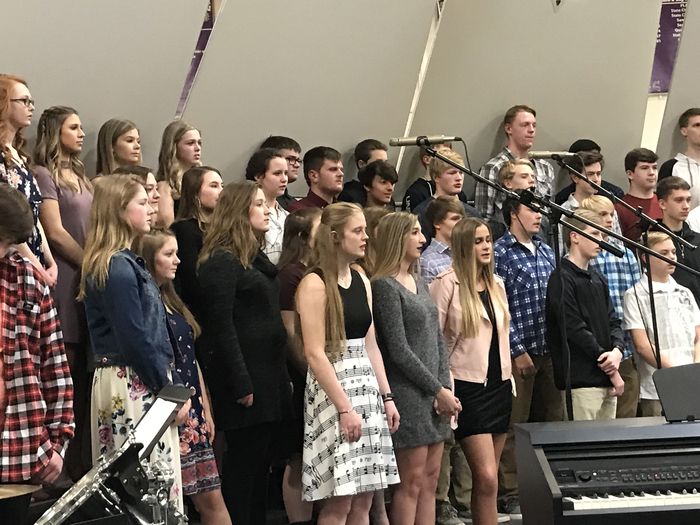 Good luck to our BHS Band and Vocal Music students today as they compete in the SDHSAA's Region I Large Group Music Contest in Vermillion! The BHS Band is directed by Mr. Brian LeMaster. The BHS Chorus is directed by Miss Emily Ayres. Congratulations to BHS senior Aubrey Twedt who signed her letter of intent this morning to play basketball for Mt. Marty! GO LANCERS! 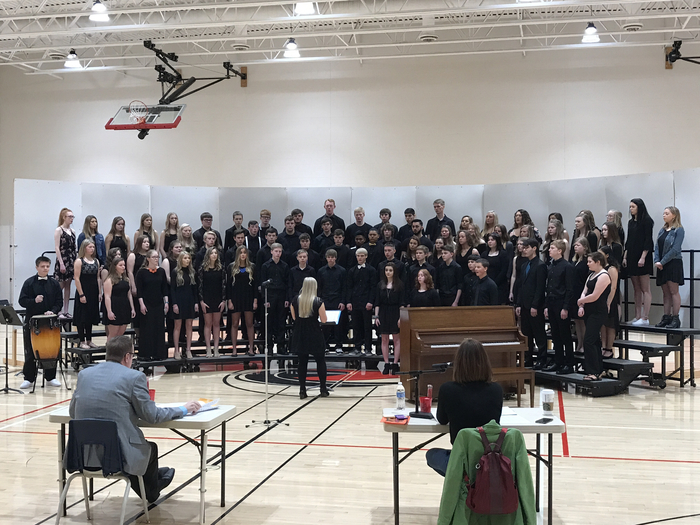 Congratulations to our 7th/8th Grade Vocal and Band students on an outstanding performance at the Big East Conference Large Group Contest held this past Friday! Our Vocal students received 1+ superior ratings from both judges. Our Band students received a 1 & 1- superior rating. The BHS Junior/Senior Prom "Fabulous 50's" decorating has been completed! The Grand March will begin at 7:00 p.m. on Saturday, March 30 in the BHS gym. The doors will open at 6:30 p.m.
A big thank you to PEERS, our volunteers, guest presenters and speakers, and staff for making the 2019 Elementary School Chautauqua a success for our students! 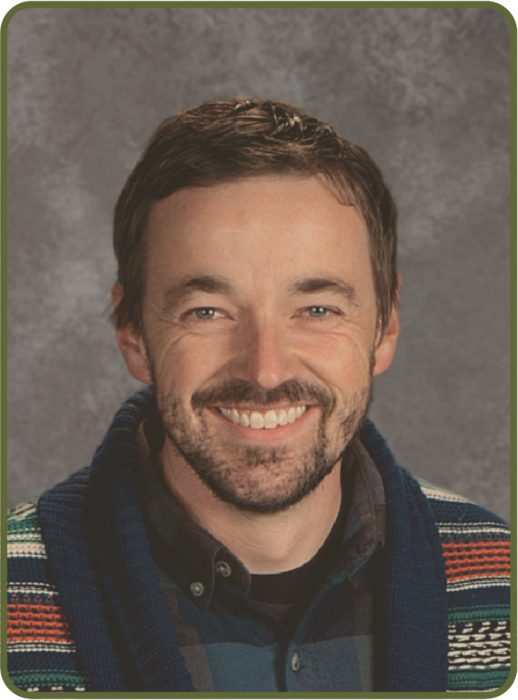 Beresford graduates Cody Christensen (2001)and Sam Nelson (2018) are presenters at Beresford Elementary Chautauqua. 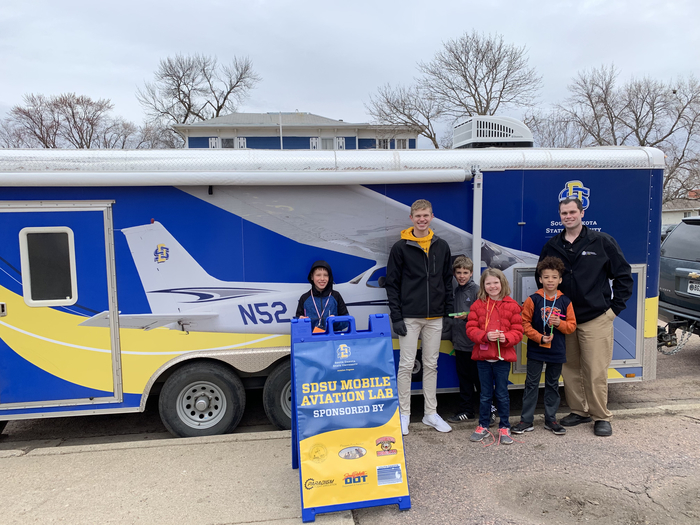 Cody is an instructor and Sam a student in the SDSU aviation program. The Jr./Sr. Prom will be held in the BHS gym on Saturday, March 30. The gym doors will be open to the public at 6:30 pm. The Grand March begins at 7:00 pm. The Banquet will be held at 8:00 pm. The Dance will begin at 9:00 pm and end at midnight. Enjoy prom and stay safe! Today at BHS, our students in grades 9-12 will be engaged in a symposium with guest speakers from the SD Dept. of Labor, SDSU, and Keystone. The four sessions include: job skills; job search, interviews, & resumes; alcohol & drug addictions; & misuse of drugs and opioids. 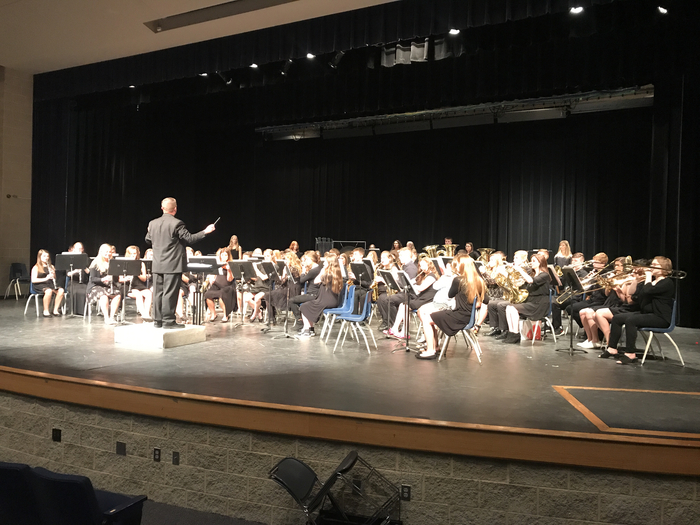 These events will be broadcast live at no cost on the NFHS Network: March 30 Grand March, April 25 K-5 Concert, May 3 HS Talent Show, May 7 MS/HS Band Concert, May 13 MS/HS Vocal Concert, May 15 Baccalaureate, & May 18 Graduation. Please set up an account or download the app. Congratulations to Beresford/Alcester-Hudson senior wrestler Wyatt Knudson who was named to the 2019 Academic All-State Wrestling Team! 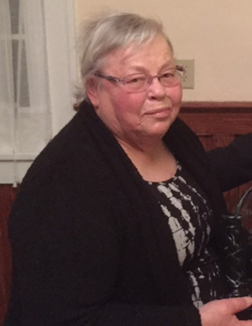 The Dagny Lerseth Helping Hands account has been created to support students in need and will be an ongoing fund to collect future donations. Future contributions can be made payable to Beresford School memo “DL Helping Hands” Thank you for your support! Good luck to our BHS Quiz Bowl Team today as they compete at the Big East Conference Quiz Bowl in Baltic! Team members are: Ty Regehr, Gavin Bautista, Jackson Heiberger, Sydnie Boone, and Caleb Weiland. Mrs. Noelle Muller is our Quiz Bowl coach. 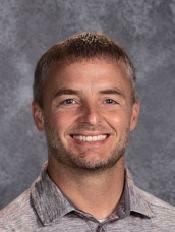 Congratulations to our Head GBB Coach Scott Ebert on being named the 2019 Region 6 GBB Coach of the Year! Coach Ebert helped guide the Watchdogs to a 20-3 record, a share of the Big East Conference regular season title, a Big East Tourney championship, and to the SoDak 16! Congratulations to the following seniors on being named to the Academic All-State Boys Basketball Team: Jack Antonson, Alec Atwood, Tyler Kropuenske, Conner Thaler, and Beau VanGelder! Congratulations to the following seniors on being named to the Academic All-State Girls Basketball Team: Alana Bergland, Sydney Nelson, Aubrey Twedt, and Faith Weiland! Congratulations to the following student-athletes on being named to the Big East All-Conference Boys Basketball Team: Tyler Kropuenske (2nd team); Alec Atwood (Honorable Mention); and Jack Antonson(Honorable Mention)! Congratulations to the following student-athletes on being named to the Big East All-Conference Girls Basketball Team: Kennedy Goblirsch (1st team); Alana Bergland (2nd team); Jessica Niles (3rd team); Sydney Nelson (Honorable Mention); and Aubrey Twedt (Honorable Mention)! 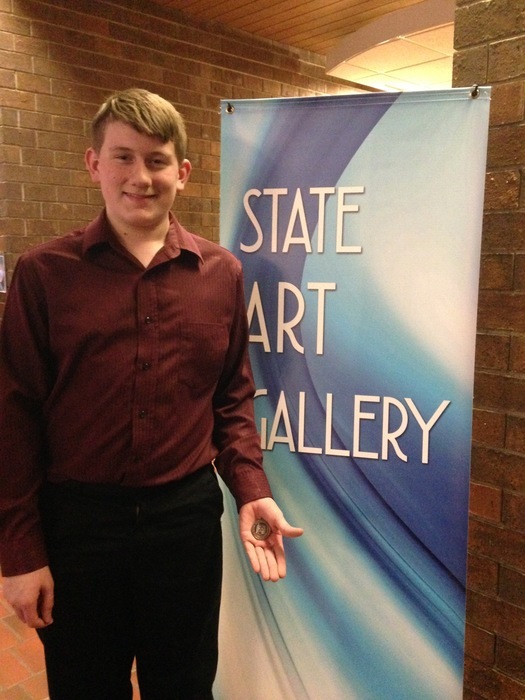 Congratulations to 8th grader Lane Klarenbeek who placed 3rd at the SDHSAA's State "A" Visual Arts Contest in the Three Dimensional (3D) Sculpture division on March 14-16 in Rapid City! His artwork was titled, “The Fire King.” Mrs. Julie Saugstad is our K-12 Art Teacher. 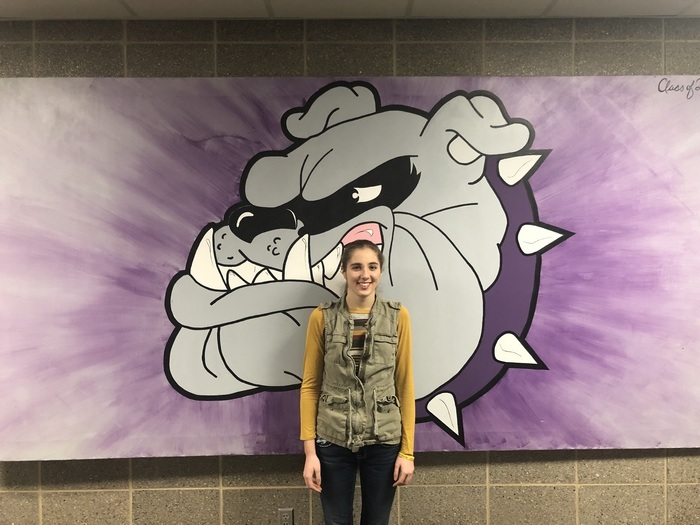 Congratulations to BHS senior Kaylen Hoffbeck who placed 2nd at the SDHSAA's State "A" Visual Arts Contest in the Mixed Media division on March 14-16 in Rapid City! Her artwork was titled, “Observing the Universe’s Pieces.” Thirty-seven schools and 330 art pieces were judged. Busy night for the BHS music dept. Members of the band at the Big East Conference Honor Band and the Choir performing at Canton. Beresford Elementary School students are enjoying the American Heart Association's Jump Rope for Heart today! Thank you to Mrs. Kelly Knutson and Mr. Andrew Gray for organizing the event and all of the activities for our students! Due to the condition of gravel roads in the District, buses will run on hard surfaced roads only. Bus route drivers have been asked to make arrangements with families as to the best location to pick up and drop off students on hard surfaced roads. Thanks for your cooperation. Due to the flooding and road conditions, as well as the forecast for tomorrow, there will be NO SCHOOL in the Beresford School District on Thursday, March 14. The last day of school for students is now Thursday, May 23. The heavy rain today has caused flooding and ponding of water. Please be aware of flooded roads, washed out roads, rutted roads, and very muddy conditions on gravel roads that can pull a vehicle off the road. Do NOT drive or walk into flooded areas! Please travel safely! 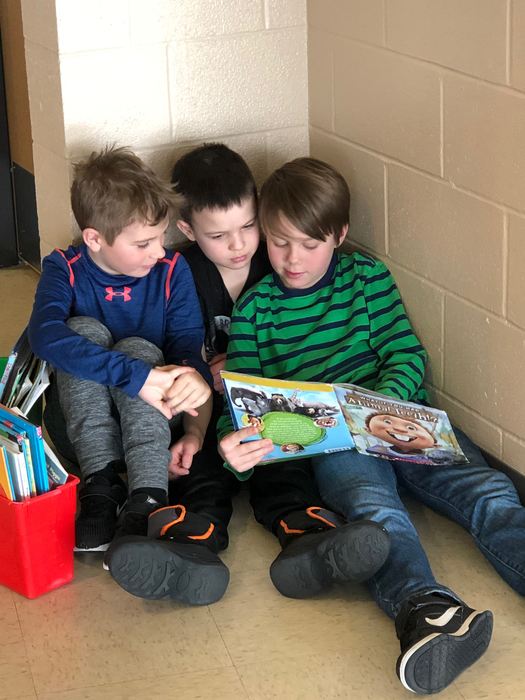 1st and 4th grade reading buddies enjoying a book together this Friday afternoon! Good luck to our GBB Team tonight in the SoDak 16 at Brandon Valley High School! 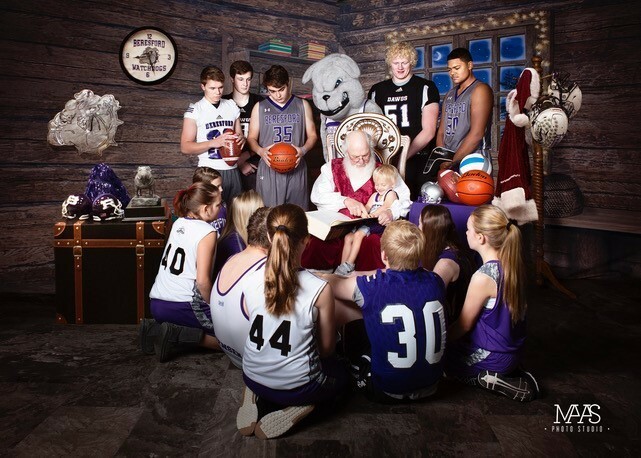 The Watchdogs will play MCM at 8:00 p.m. for a birth to the State "A" Tourney in Sioux Falls on March 14-16. The game can be viewed online at: https://www.youtube.com/watch?v=TQo-OG8qMo0. Good luck to our BHS Instrumental Music students today in the Region I Solo and Ensemble Contest at Lennox! The Watchdogs GBB Team will play McCook Central-Montrose in the SoDak 16 on Thursday, March 7 at 8:00 p.m. at Brandon Valley HS. In the first game at 6:30 p.m., Lennox will play SF Christian. The two winners will advance to the State A GBB Tourney in SF on March 14-16. Per the SDHSAA, due to school cancellations, weather conditions and road conditions, all Class A GBB SoDak 16 contests for tonight (Monday, March 4) have been postponed to Thursday, March 7 at the same time and same locations as previously scheduled. The District intends to take a spectator bus to the SoDak 16 GBB game at Brandon Valley HS on Monday. The bus is open to students in grades 6-12. There will be no charge to ride the bus but students will need to bring $4.00 for admission. 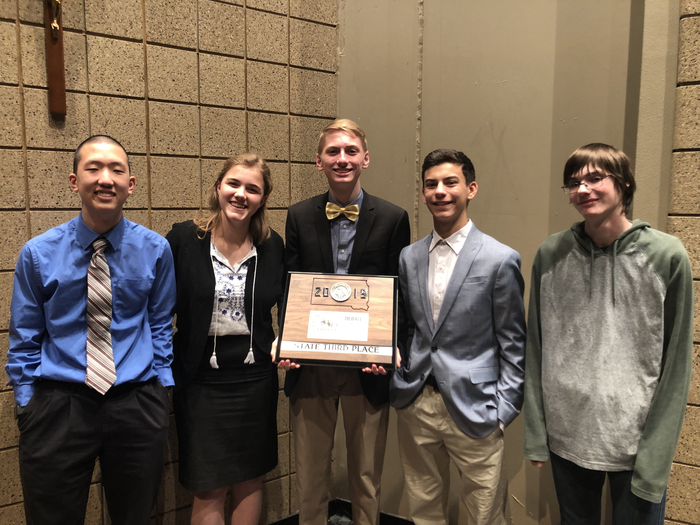 The bus will leave BHS at 6:00 p.m.
Congratulations to the BHS Debate Team on their 3rd place finish at the State A Tourney! Emelye Josko & Gavin Bautista were finalists in Intl. Extemp. Caleb Weiland was a semi-finalist in Lincoln Douglas debate. Emelye Josko & Ty Regehr were qtr. finalists in public forum. Congratulations to the GBB team on their exciting win over Vermillion in the Region Semi! The Watchdogs will play MCM in the second game of the SoDak 16 at Brandon Valley HS on Monday at 8:00. Lennox plays SFC in the first game at 6:30. GO WATCHDOGS! Thank you to our BHS FFA Chapter for serving a pancake breakfast to our school staff and community this morning! 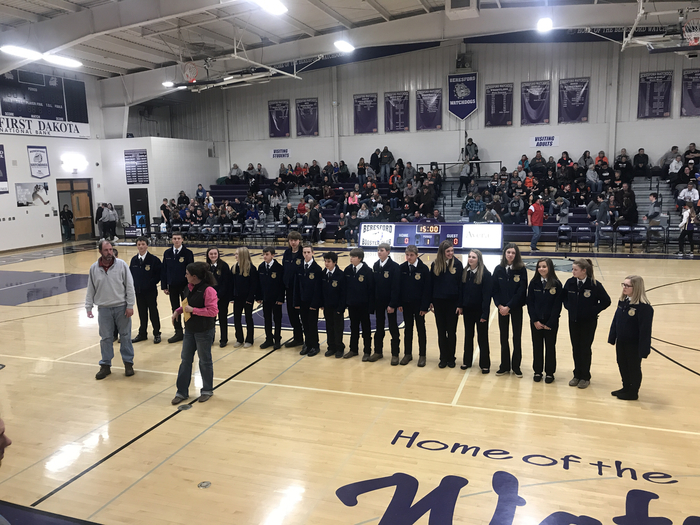 Our FFA Chapter would like to thank the District and the Beresford Area Community for its continued support! The Region 4A Semi-Final GBB game between the Beresford Watchdogs and Vermillion Tanagers will be held in Beresford on Thurs., Feb. 28 @ 7 p.m. Doors will open at 5:45 p.m. The winner will advance to the SoDak 16. Admission is for $6 adults and $4 for students. GO WATCHDOGS!! The Region 4A GBB game in Beresford will be broadcast at https://www.nfhsnetwork.com/. No passes will be accepted as this is a SDHSAA event. Admission is $6 for adults and $4 for students. BHS coaches and athletes will be selling pulled pork sandwiches at the concessions. 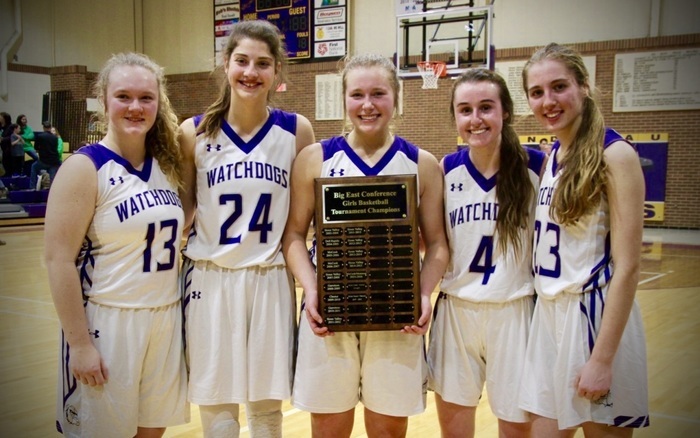 Good luck to our Watchdog Girls' Basketball Team tonight as they host the Canton C-Hawks in the Region 4A Tourney at 7:30 p.m. GO WATCHDOGS! Congratulations to our Debate Team! Caleb Weiland placed 7th in Domestic Extemp and is the 3rd alternate to the NSDA National Tournament. Jackson Heiberger placed 7th and Caleb 10th in Lincoln-Douglas. Emelye Josko placed 10th and Gavin Bautista 12th in International Extemp. Parent-Teacher Conferences will be held on Monday, February 25 from 3:30-7:00 p.m. and Wednesday, February 27 from 3:30-6:00 p.m. We hope you can attend! Due to the amount of drifting on the country roads, there will be a two-hour late start on Monday, February 25. Buses will travel where possible. Please travel safely! Good luck to our BHS Debate Team as our students compete in the National Qualifier Tournament at Sioux Falls Washington on Feb. 22-23! Our students participating include: Emelye Josko, Ty Regehr, Gavin Bautista, Ashleigh Colford, Caleb Weiland, and Jackson Heiberger. Good luck to the BAH Wrestling Team at the State "A" Tourney in Rapid City on Feb. 22-23! Our 8 state qualifiers are: 120-Jovey Christensen, 132-Logan Serck, 138-Payton Borah, 152-Trevor Stene, 160-Wyatt Knudson, 182-Ethan Reed, 195-Andrew Jensen, and 285-Jace Wurth! GO BAH!! There will be a winter sports pep rally this morning (Thursday, February 21) at 10:00 in the BHS gym. The BAH Wrestling Team and Watchdog Girls' and Boys' Basketball Teams will be recognized. The pep rally will also be a send-off for our 8 BAH State "A" Wrestling qualifiers! Due to the large amount of snowfall received overnight and the winter storm warning we are under, there will be NO SCHOOL in the Beresford School District today, Wednesday, February 20. 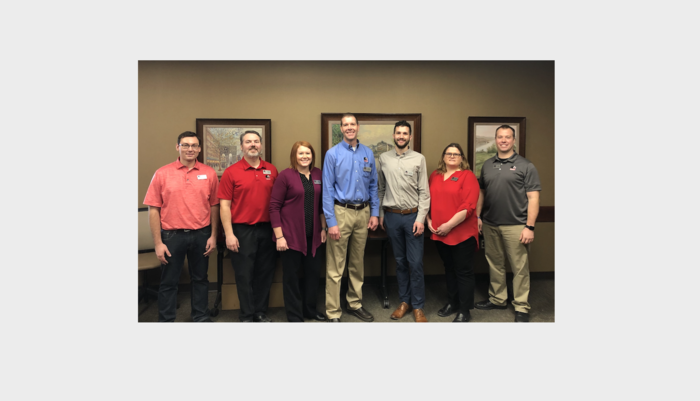 SD School Board Recognition Week is Feb. 18-22, 2019. We would like to thank our members for their leadership and service to our district and community! 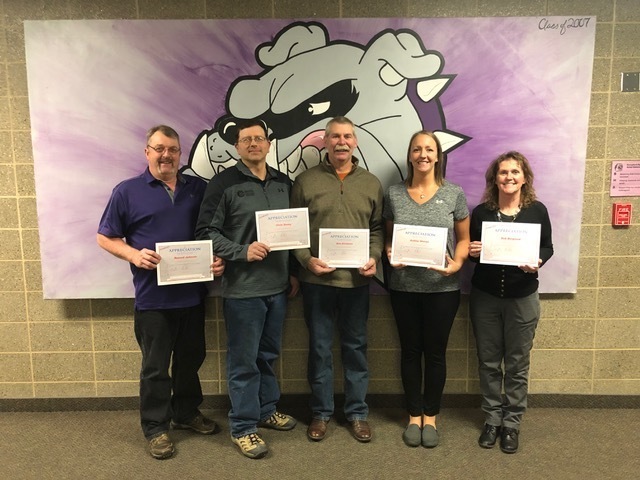 The women and men serving our District are: Deb Bergland, Ashley Sharpe, Chris Savey, Dan Erickson, and Russell Johnson. This week is National FFA Week! Today is Class Color & Greenhand Day. Wednesday is Official Dress Day & Pancake Feed from 7-9 a.m. in the new shop. Thursday is Denim Day and Petting Zoo in the original shop. Friday is Flannel Day & Drive Your Tractor to School. Congratulations to the Beresford/Alcester-Hudson Wrestling Team on their 3rd place finish in the Region 2A Tourney held at the Sanford Pentagon in Sioux Falls on Feb. 15! Eight BAH Wrestlers have advanced to the State A Tourney in Rapid City on Feb. 22-23! Good Luck at State! 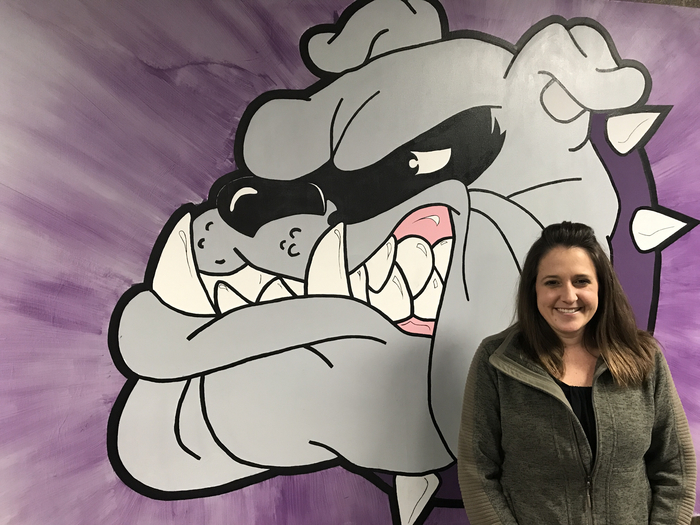 Congratulations to Beresford FFA advisor Bridget Twedt as she will be awarded her honorary FFA degree while at State FFA. Congratulations Mrs. Twedt! Thank you to the generous sponsors of the Beresford FFA Blue Jacket Bright Futures Program: 1. Jerry’s Chevrolet 2. Southeast Farmers Elevator 3. Jason and Bridget Twedt Thank you sponsors for your dedication to the Beresford FFA Chapter. Good luck to our Beresford/Alcester-Hudson Wrestling Team as they compete in the Region 2A Tourney on Friday, Feb. 15 at 1:00 p.m. at the Sanford Pentagon in Sioux Falls! The top 4 place winners will advance to the State "A" Tourney in Rapid City on Feb. 22-23. Tonight's Girls' and Boys' Basketball double-header between our Watchdogs and the Lennox Orioles can be viewed on the NFHS Network by clicking on the following link: https://www.nfhsnetwork.com/schools/beresford-high-school-beresford-sd. GO WATCHDOGS!! Top-notch vocal and instrumental concert tonight. Great performances by talented and dedicated students! 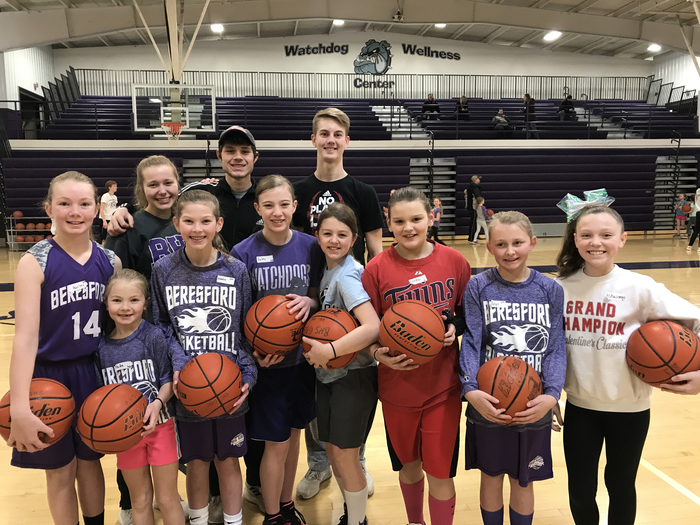 The Beresford Girls and Boys Basketball teams will play a double-header at Elk Point-Jefferson tonight. If you would like to watch the livestream, please click on the following link: https://www.youtube.com/channel/UC0ngRd2muXUkxEt2uQ1jkvw/featured. GO WATCHDOGS!! Due to the early morning wind chill, there will be a two-hour late start on Friday, February 8. There will be no morning practices or activities. Please travel safely. Please come out and support our Grades 7-12 Bands and Choirs on Monday, February 11. 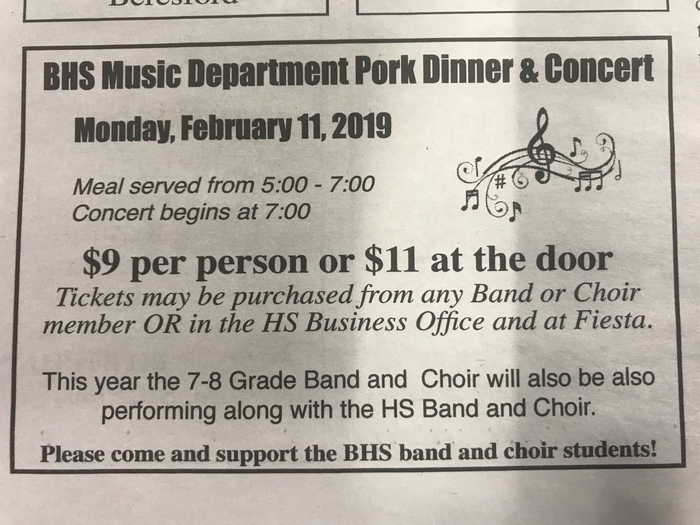 They are hosting their Pork Dinner fundraiser from 5:00-7:00 p.m. Their concert will begin at 7:30 p.m. in the BHS Gym. The Girls and Boys Basketball double-header with Garretson for tonight has been postponed. The schools are trying to find a make-up date. The Beresford Boys' Basketball team will still play at Wagner in their main gym on Friday, February 15. The C game will begin at 5:10. The JV game will begin at 6:30. The Varsity game will begin at 8:00. Please note the GBB schedule changes. The girls were originally scheduled to play at Wagner on Fri., Feb. 15 but that game has been moved to Thurs., Feb. 14 at 4:00, 5:10, and 8:00. The girls will play a make-up varsity game only at home with Chester on Fri., Feb. 15 at 5:00. Congratulations to BHS senior Jack Antonson who signed his National Letter of Intent this morning to play football at Minnesota State University Moorhead! GO DRAGONS!! The Watchdog Hall of Fame Class of 2019 nominations are due on Friday, Feb. 15. The Steering Committee is accepting nominations in the 4 pillars of Academics/Achievement, Fine Arts, Athletics, and Distinguished Service. Please click on the link to nominate: https://5il.co/5s4k. Tonight's home Girls Basketball game vs. Chester is postponed due to weather conditions north of Sioux Falls. The game will be rescheduled at a later date. 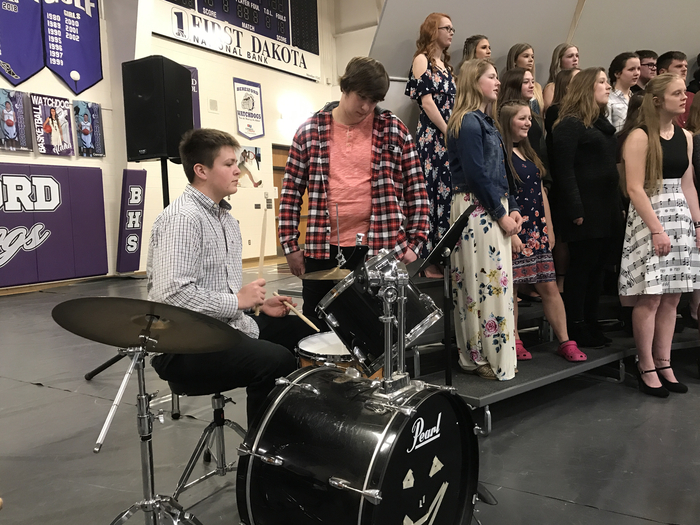 Good luck to our BHS Vocal Music students tomorrow as they participate in the Region I Vocal Solo and Ensemble Contest at Yankton High School! The vocal students are under the direction of Miss Emily Ayres. BHS performed their play titled, “Cut” at the State One Act Play Festival. The Festival was held in Aberdeen at NSU on Jan. 31-Feb. 2. Congratulations to the BHS actors who earned “Superior” Actor awards: Kaylen Hoffbeck, Carson Johnsen, Makayla Nelson, and Caleb Weiland! Purchase your pork dinner tickets in advance at Fiesta, School Business Office or band/vocal students to save $2 per ticket. Pulled pork, cheesy potatoes, green beans, dinner roll and dessert. This is always a fun event and concert. 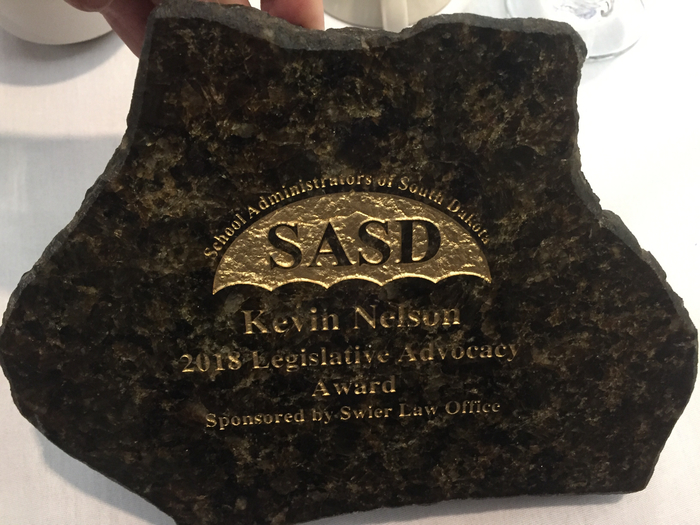 Congratulations to Beresford Elementary School Principal Mr. Kevin Nelson who was presented with the School Administrators of South Dakota 2018 Legislative Advocacy Award! Mr. Nelson has been an elementary school principal for 27 years. Due to the wind chill warning and extremely cold temperatures, there will be a 1:30 dismissal on Tues., Jan. 29 and NO SCHOOL on Wed., Jan. 30. All school practices and activities for Tues. and Wed. have been postponed. 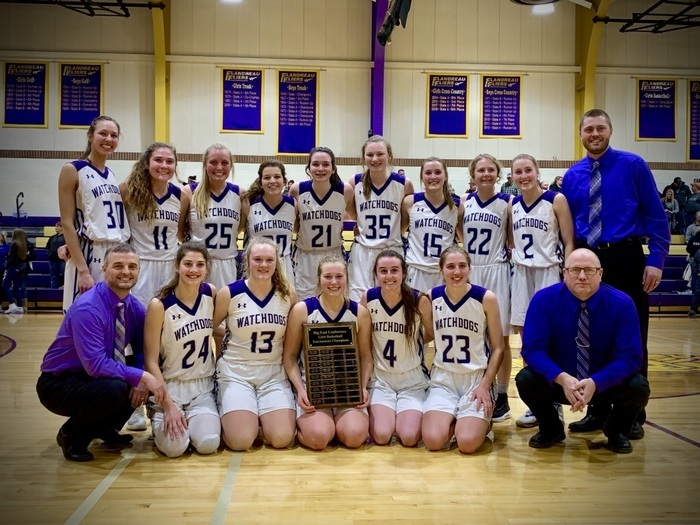 Congratulations to the BHS Varsity Girls Basketball Team on winning the Big East Conference Tourney Championship over McCook Central-Montrose on Saturday, January 26 in Flandreau!! Way to go Watchdogs!! Due to the wind and cold temperatures, Bingo for Books that was scheduled for tonight at Beresford Elementary School has been canceled. The Vermillion Valley Council will do their best to reschedule this event if possible. Thank you for your understanding! Good luck to our GBB team tonight in the semi-final round of the Big East Tourney at Baltic. Beresford will play Flandreau in the second game at 7:30. View the game: https://www.youtube.com/channel/UCQvyFTHrlefb2EOoW9zFmyg Flandreau v. Beresford Girls Basketball tonight. Good luck to our Beresford-Alcester/Hudson Wrestling Team as they travel to the Wagner Tourney on Saturday, January 26 at 10:00 a.m.! Good luck to our GBB Team as they compete in the Big East Tourney on Jan. 24-26! Tonight and tomorrow night, the Watchdogs will play in Baltic. On Saturday, the finals are in Flandreau. Tonight, #3 Flandreau plays #6 Chester at 6:00 and #2 Beresford plays #7 Baltic at 7:30. Good luck to our BHS Debate Team as they compete in the Yankton Invite on Friday, January 25! Those competing include: Caleb Weiland, Jackson Heiberger, Emme Josko, Gavin Bautista, and Christian Mayberry. 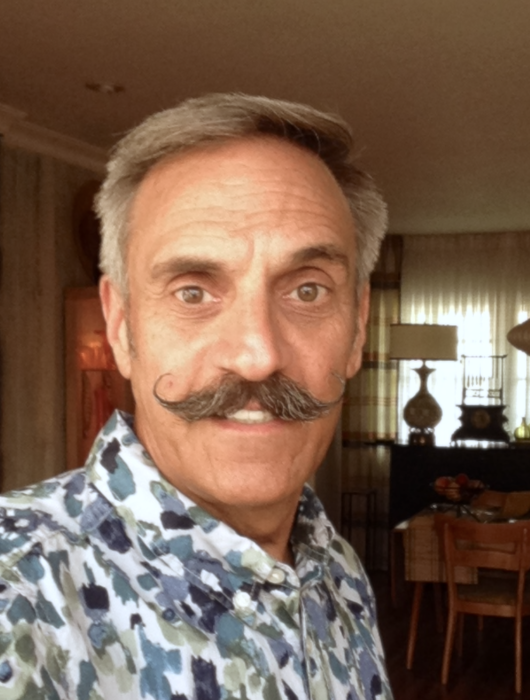 Our Debate coach is Dr. Tommy Merriman. 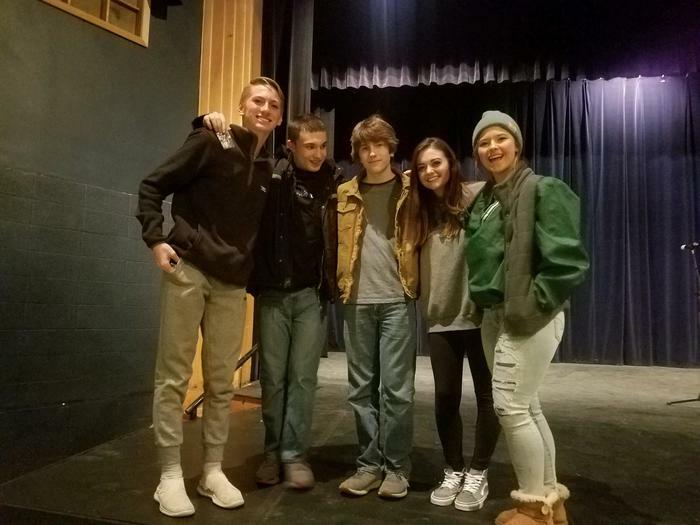 Congratulations to Caleb Weiland, Gabe Poppenga, Isaac Andal, Kaylen Hoffbeck, and MaKayla Nelson for receiving “Superior” Actor awards at the Region One Act Play Contest! BHS will perform their play titled, “Cut” by Ed Monk, in Aberdeen on Friday, Feb. 1 at 2:45. GOOD LUCK! Congratulations to the BHS One Act Play cast and crew on qualifying for the State One Act Festival! 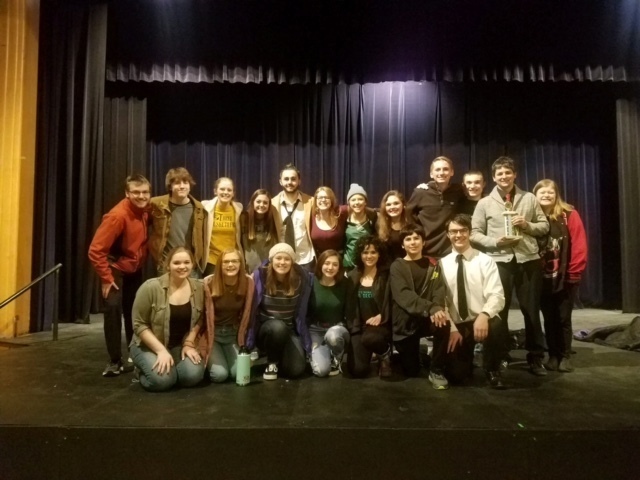 Yesterday, at the Region One Act Play Contest at Mount Marty College in Yankton, BHS received a Superior ranking, in which all three judges awarded BHS 1st place! Congratulations to Aubrey and Cali Boden who signed their National Letters of Intent to compete in Track and Field for the University of Sioux Falls! GO COUGARS! 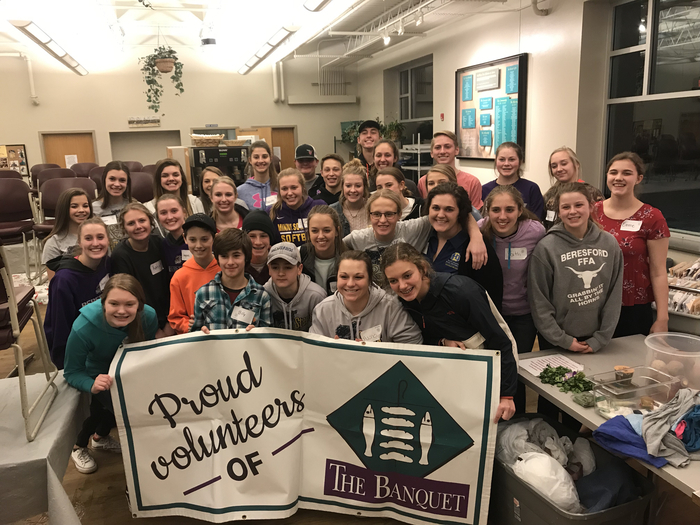 This evening, the BHS FFA and Student Council collaborated to serve at the Banquet in Sioux Falls. Our students, staff, and parents served 280 people. They also provided a monetary donation for the meal costs. 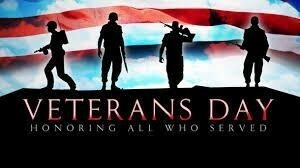 Thank you for your servant leadership! Due to the snowfall and wind that is forecast, there will be NO SCHOOL in the Beresford School District on Friday, January 18th. Also, a reminder that there is NO SCHOOL on Monday, January 21st in honor of Martin Luther King, Jr. Day. 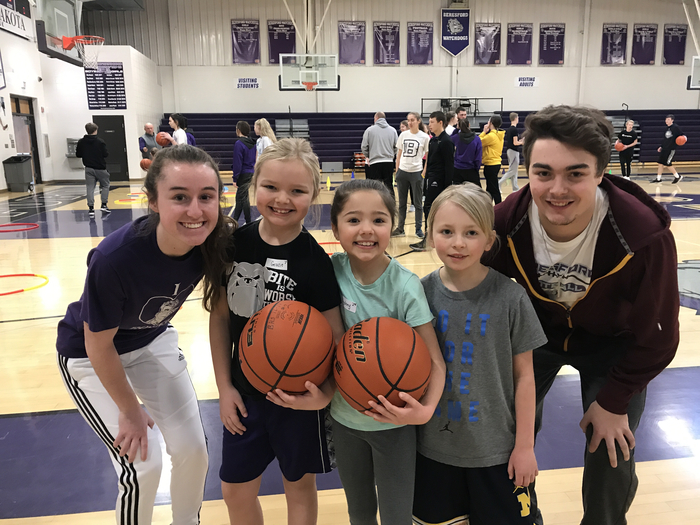 Due to the weather forecast and cold temperatures for Saturday morning, the Little Watchdog Basketball Clinic scheduled for Saturday, January 19 has been postponed. A make-up date will be set soon. We will still recognize the Little Watchdogs at the BB games on January 29. Due to the predicted snowfall and wind that is forecast for Friday, the BB double-header with Canton has been moved to tonight (Jan. 17) at 5:30 p.m. in the BHS gym. The Varsity Girls will play at 5:30, followed by the Varsity Boys at 7:00. There will be no sub-varsity games. Please come out and support our One Act Play Cast & Crew as they perform a comedy titled, "Cut” by Ed Monk on Saturday, January 19 at 7:00 p.m. in the Elementary Gym. They will competing in the SDHSAA Regional One Act Play Contest on Tuesday, January 22 in Yankton! Good luck! USD's Dental Hygiene Department will be at Beresford School February 26th-28th. They will be offering FREE fluoride treatments, screenings, and sealants. Cleaning and x-rays available with payment. https://5il.co/67pt for consent form. 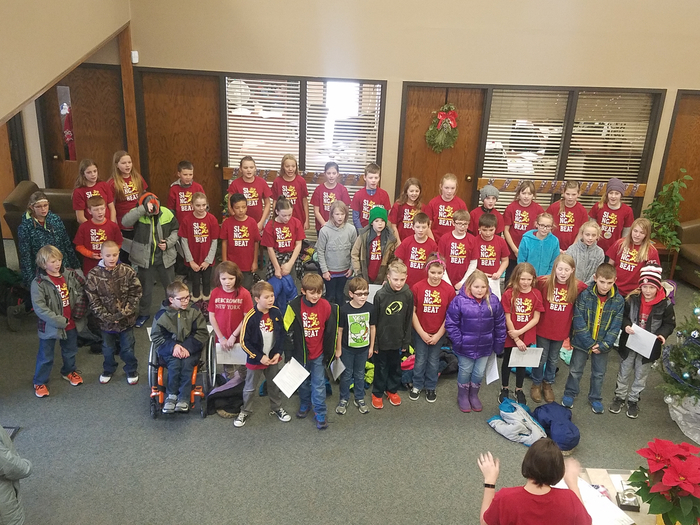 At its January 14 meeting, the Beresford School Board recognized our 4th, 5th, and 6th graders who were selected by a recorded audition into the South Dakota Elementary Honor Choir. Their concert was held in Rapid City. Congratulations! This morning, staff members were engaged in CPR and AED training. The Beresford School District would like to thank EMT Andrew Boden for providing the training! Please click on the following link below to view tonight's boys basketball games between the Beresford Watchdogs and McCook Central-Montrose Fighting Cougars. 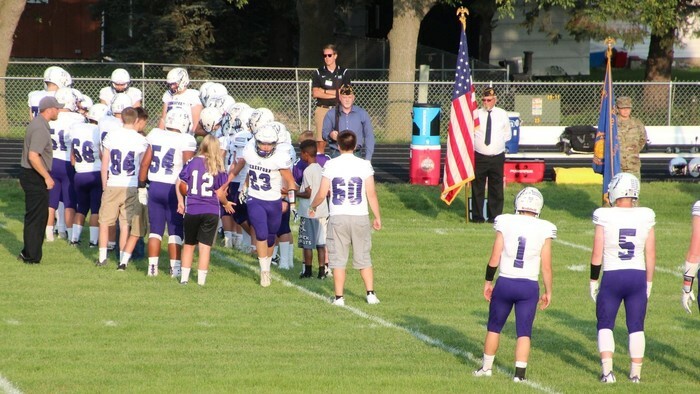 GO WATCHDOGS!!https://www.nfhsnetwork.com/schools/beresford-high-school-beresford-sd. State Wrestling Tourney tickets are now available for purchase. 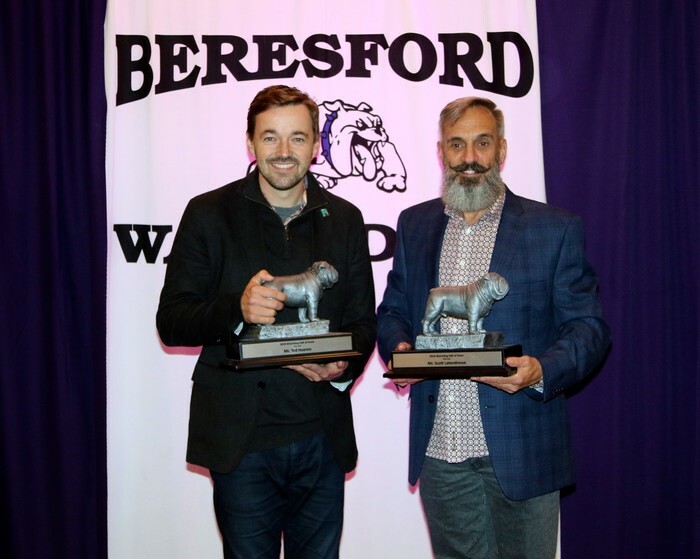 Please click on the following link and complete the form for Beresford HS: https://tinyurl.com/yb6gzutj. 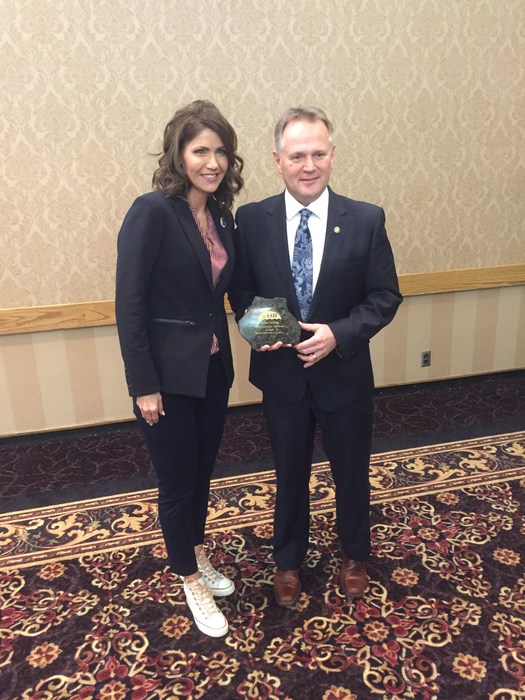 Both the "A" and "B" Tourney will be held in Rapid City at the Rushmore Plaza Civic Center on Feb. 22-23. 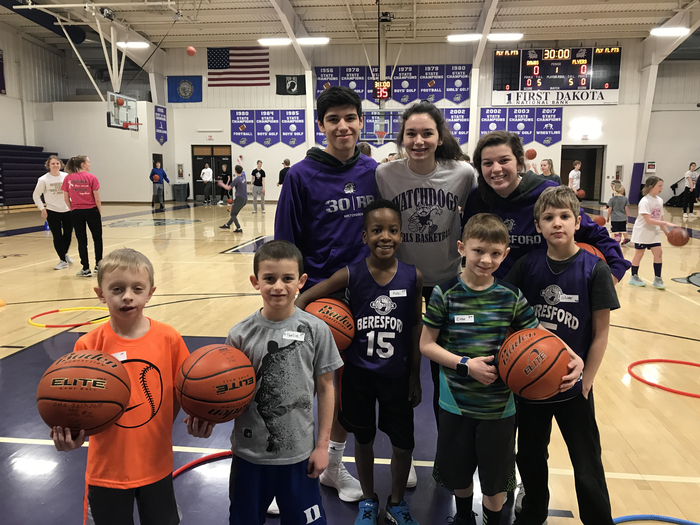 The Beresford Athletic Booster Club and Watchdog BB Teams will host a free Little Watchdog BB Camp for grades 1-6 on Sat., Jan. 19 from 8:30-10:00 a.m. in the HS Gym. For more information and to register your child, please click on the following link: https://5il.co/622j. The Big East Conference Boys BB Tourney matchups have been released. Beresford will host two rounds on January 3 & 4 at 6:00 p.m. Beresford will host: #1 SV v. #8 Chester and #4 Beresford v. #5 MCM. Garretson will host: #2 Parker v. #7 Baltic and #3 Flandreau v. #6 Garretson. Tonight's girls' and boys' basketball double-header between the Beresford Watchdogs and the Sioux Valley Cossacks at Volga will be broadcast live on the NFHS network. 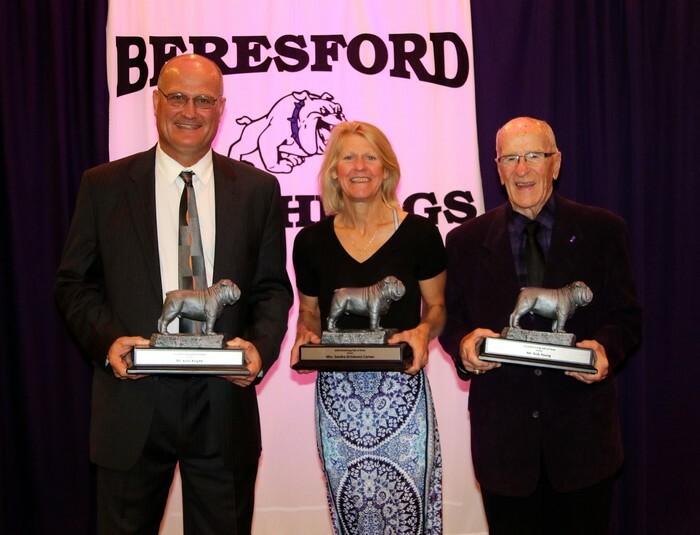 Please click on the following link: https://www.nfhsnetwork.com/schools/beresford-high-school-beresford-sd. Congrats to BHS senior Blake Peterson on signing his national letter of intent to play football for the Iowa State University Cyclones of the Big XII! Recently, Blake was named to the Class 11B All-State and Argus Leader Elite 45 Football Teams as a defensive end! GO CYCLONES! On Tuesday, BAH will host West Monona in a Wrestling Dual at 6 pm in the BHS gym. It is also Senior Parent's Night! The match will feature the Chesnut father-son battle! 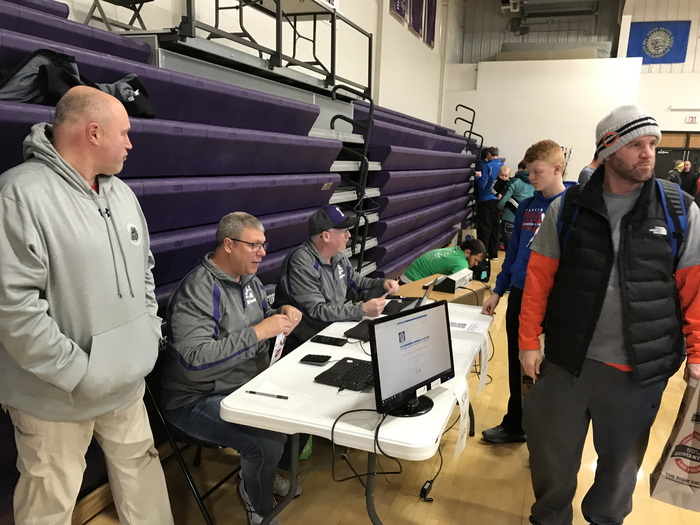 The dual will be broadcast live at https://www.nfhsnetwork.com/schools/beresford-high-school-beresford-sd. Good luck to our BHS Quiz Bowl team tomorrow, December 18 as they compete at Canton! Team members are: Shaylen Andal, Cassidy Sjovall, Leonela Perez, Marisa Klumper, Gavin Bautista, Emelye Josko, and Carlie Johnke. Their coach is Mrs. Noelle Muller. 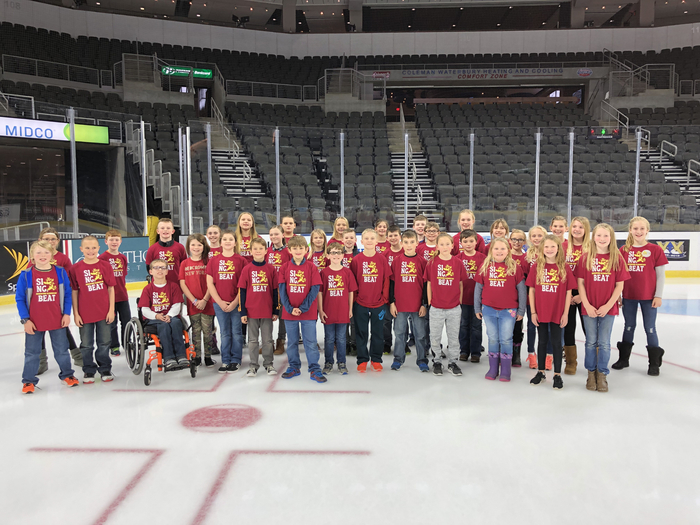 Members of the 4th/5th grade BEAT caroled at First Savings Bank this afternoon and also sang the Star Spangled Banner at the Stampede hockey game. Great job BEAT! Tonight's GBB/BBB games between the Beresford Watchdogs and the Flandreau Fliers will be broadcast live on the NFHS network at the following link: https://www.nfhsnetwork.com/schools/beresford-high-school-beresford-sd. A subscription fee is required. GO WATCHDOGS!! 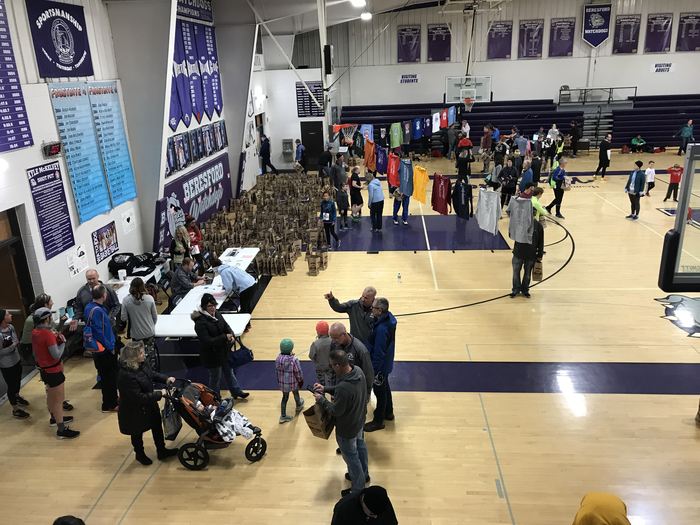 Beresford's 20th Anniversary Frostbite 4 will be held at BHS on Sat., Feb. 2, 2019 at 11:00 am. 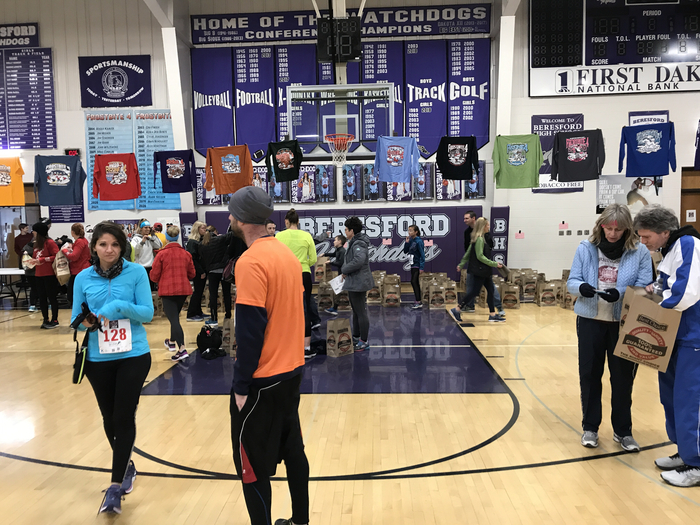 The Frostbite 4 continues to be a primary fundraiser for the Beresford Athletic Booster Club. Please register online at: https://www.allsportcentral.com/EventInfo.cfm?EventID=68356. Tonight's basketball double-header with Baltic will be broadcast on the Baltichighschool youtube channel at 4:00--Girls JV, followed by Boys JV, Girls Varsity, and Boys Varsity. Go Watchdogs! The Watchdog Hall of Fame Steering Committee is seeking nominations for the Watchdog Hall of Fame Class of 2019 in the pillars of Academics/Achievement, Fine Arts, Athletics, and Distinguished Service. Please click on the following link to nominate: https://5il.co/5s4k. The Beresford-Alcester/Hudson Wrestling Team will now be hosting a Wrestling Dual vs. West Monona, IA on Tuesday, December 18 at 6 p.m. in the BHS gym. This will also be Senior Parents' Night for our Wrestling Team and Cheerleaders. Congratulations to BHS senior Alana Bergland on being named to the Class “A” All-State Volleyball Second Team! Alana was previously named to the Academic All-State Volleyball Team, Big East All-Conference Volleyball Team, and All-Region First Team! Congratulations to BHS senior Dallas Davis who signed his national letter of intent to run Cross Country and Track & Field for the Dakota State University Trojans! Pictured with Dallas is BHS Head XC and TF Coach Matt Coy and DSU Head XC and TF Coach Anthony Drealan! Thank you Sioux Corporation for the learning experiences today! Your efforts were greatly appreciated. This morning, the Elementary Student Leadership Academy made up of 4th and 5th graders visited the Beresford Volunteer Fire Department and Ambulance Service to learn more about this special group of volunteers and how they serve our community! Winter weather is here and winter driving can be extremely hazardous at times due to poor road conditions or reduced visibilities from heavy or blowing snow. Please click on the following link for important information on Winter Travel Safety Tips: https://5il.co/5qfy. 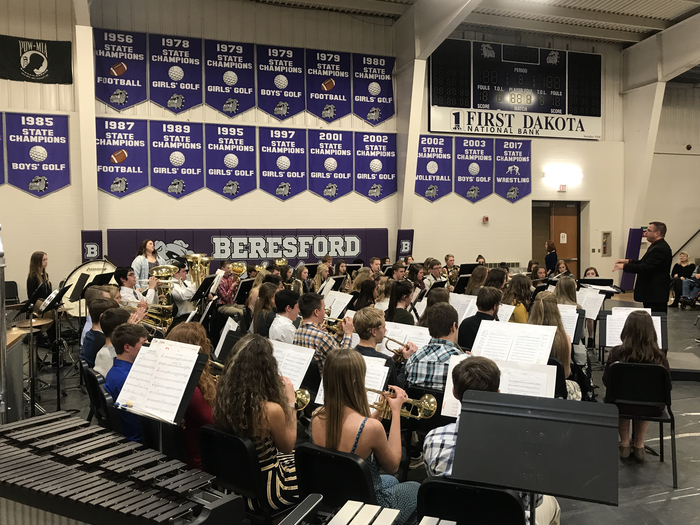 The District's Holiday Concerts can be viewed for free as a live web stream or as an archived event by clicking on the following link: https://www.nfhsnetwork.com/schools/beresford-high-school-beresford-sd. Elem. on Nov. 29 @ 7pm; MS on Dec. 4 @ 7pm; & HS on Dec. 6 @ 7 pm. Due to the icy road conditions, there will be a two hour late start in the Beresford School District on Thursday, November 29. Please travel safely! Best wishes for a Happy Holiday Season from the Watchdogs!! Photo courtesy of Maas Photo Studio. 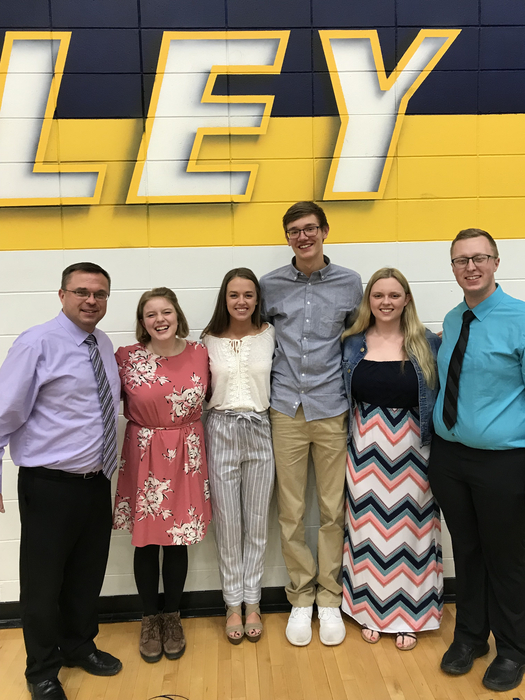 Congratulations to the following students who are representing BHS at the Region I Honor Band Concert in Yankton today--Kaitlyn Ellis, Kaden Petersen, Hannah Josko, and Jackson Heiberger. The concert will be at 7:00 p.m. Our band director is Mr. Brian LeMaster. Good luck to our HS Quiz Bowl Team today as they compete at the Sioux Falls Roosevelt Invite! Team members are: Alyssa Hartsock, Caleb Weiland, Sydnie Boone, Cassidy Sjovall, and Carli Johnke. Our Quiz Bowl Coach is Mrs. Noelle Muller. Congratulations to our BHS Debate Team on a great performance at the Mitchell HS McGovern Debate Tourney this weekend! They earned 2nd place in Class A debate! Our Public Forum teams went a combined 11-4 and Caleb Weiland earned 4th in Varsity Intl. Extemporaneous speaking! Good luck to our BHS Debate Team today as they compete at the Mitchell Tournament! The following students are competing today: Johnathan Carlson, Caleb Weiland, Emelye Josko, Gavin Bautista, and Isaac Andal. 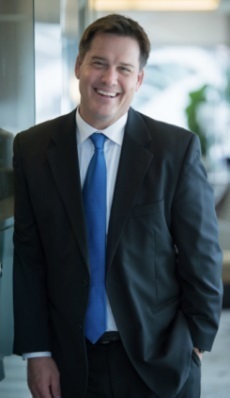 Our Debate Coach is Dr. Tommy Merriman. Congratulations to our Class 11B All-State Football players: Sr. Jack Antonson-WR, Jr. Brad Christensen-LB, Sr. Blake Peterson-DE, Sr. Tyler Kropuenske-DB Hon. Men., Sr. Andrew Jensen-Center Hon. Men., and Sr. Beau VanGelder--Special Teams Hon. Men.! Congrats on a great season! Congratulations to BHS senior Alec Atwood on signing his National Letter of Intent to run Cross Country and Track and Field for the University of South Dakota! Congratulations to BHS senior Sydney Nelson on signing her National Letter of Intent to play Softball at Minnesota State University at Mankato! Congratulations to the following seniors on being named to the Academic All-State Volleyball team: Alana Bergland, Makayla Nelson, Kadison Satter, and Aubrey Twedt! Congratulations to the following seniors on being named to the Academic All-State Football team: Jack Antonson, Tyler Kropuenske, Blake Peterson, and Beau VanGelder! Congratulations to the following for being named to the Big East All-Conference Volleyball team: Sr. Alana Bergland, Sr. Aubrey Twedt, Sr. Cali Boden, and Sr. Aubrey Boden! Also congratulations to Alana Bergland and Aubrey Twedt on being named to the All-Region First Team! Congratulations to the following for being named to the Big East All-Conference FB team: Sr. Jack Antonson, Jr. Brad Christensen, Sr. Tyler Kropuenske, and Sr. Blake Peterson! Honorable Mention went to: Soph. Caden Ellingson, Sr. Andrew Jensen, and Sr. Beau VanGelder! Thank you to our BHS FFA members Conner Thaler, Cadence Stewart, Rachel Watkins, Rebecca Tiedeman, Riley Johnson, Kamrynn Sveeggen, & Hayden Wilson who responded to an apt. complex fire in Parker. They assisted in getting the residents out safely and helped extinguish the fire! Congratulations to the BHS Oral Interp team on a great performance at the Regionals in Vermillion yesterday! Caitlyn Kogel performed in poetry. Ciara Neuman performed in non-original oratory. Maiya Muller and McKayla Roelke performed a duet. The Reader's Theater also performed. Congratulations to BHS FFA members Caleb Weiland who placed 1st in Extemporaneous Speaking and Faith Weiland who placed 2nd in Prepared Public Speaking. Caleb and Faith have advanced to the State Contest in Pierre in December! 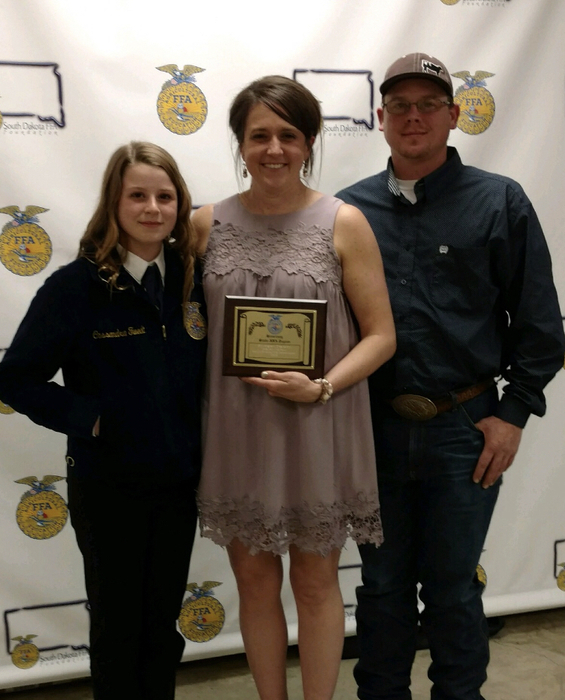 The BHS FFA Advisor is Mrs. Bridget Twedt. Congratulations to the BHS FFA Agricultural Issues team for placing 2nd at the District yesterday. Team members are Cole Olson, Riley Johnson, Kaysee Christensen, Conner Thaler, Faith Weiland, and Rachel Watkins. They have advanced to the State Contest in Pierre in December! Congratulations to the BHS FFA Agricultural Communications team for placing 2nd at the Districts yesterday. Team members are Cali Boden, Aubrey Boden, Clair Bovill, and Grace Quartier. They have advanced to the State Contest in Pierre in December! Good luck to the Beresford High School Oral Interp team today as they compete in the Regionals at Vermillion for an opportunity to advance to the State Oral Interp Contest! 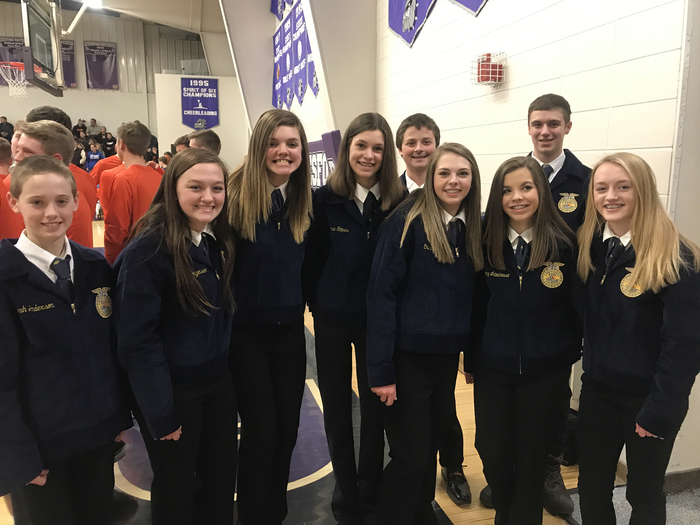 Good luck to our Beresford High School FFA Chapter today as the students compete in the Districts at Parker for an opportunity to advance to State! The BHS National Honor Society will be sponsoring a free soup and pie luncheon for all veterans and their families from 12:30-2:00 on Mon., Nov. 12 at the HS. Please contact Mrs. Shellie Pratt at 763-2145 for more information. The program will begin at 2:30 in the BHS gym. JUULing is not just harmless flavor and water vapor as the vape can contain cancer-causing chemicals, heavy metals, tin, lead, and high levels of nicotine. A single JUUL pod contains as much nicotine as a pack of 20 regular cigarettes. The Beresford High School Theater Department under the direction of Dr. Tommy Merriman will perform "The Three Musketeers" on Friday, November 9 and Saturday, November 10 at 7:00 p.m. in the Beresford Elementary Gym. Please come out and support our cast and crew! Congratulations to Sydney Nelson! Sydney is our Wendy's High School School Winner. She now advances to the state level! Congratulations to our VB Team on their first round win over Vermillion in Region 4A! #2 seed Beresford will now host #3 seed Dakota Valley on Thurs., Nov. 1 at 7 pm. #1 seed EPJ will host #5 seed Tea Area in the other matchup. The winners will advance to the Round of 16. Congratulations to Caitlyn Kogel on receiving a "Superior" rank in Poetry at the Lennox Oral Interp Contest! Also, congratulations to Casey Klungseth in Story Telling and Katelyn Jacob in Poetry for receiving "Excellent" ranks at the Contest! Their coach is Mrs. Donna Neuman. 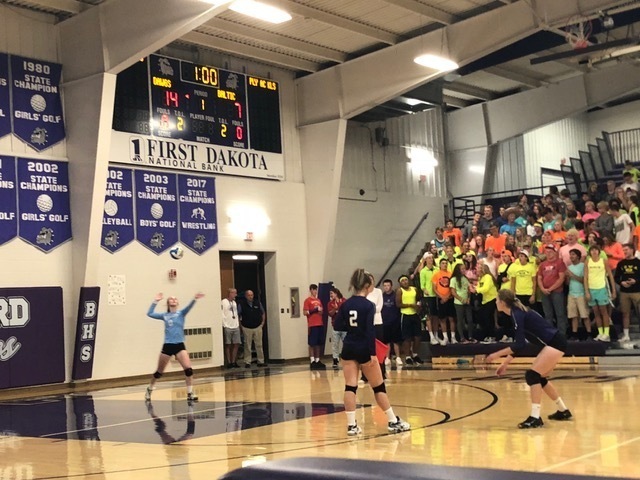 Good luck to the #2 seed Beresford Watchdog Volleyball Team tonight as they host the #7 seed Vermillion Tanagers at 7:00 p.m. in the Region 4A Tourney. The BHS Student Council dress-up theme is "Costume Night." GO WATCHDOGS! Good luck to our Oral Interp students today as they compete at the Lennox Invite! Katelyn Jacob and Caitlyn Kogel will compete in Poetry. Casey Klungseth will compete in Story Telling. Ashleigh Colford will compete in Dramatic Interp. The Region Oral Interp will be on Nov. 13. 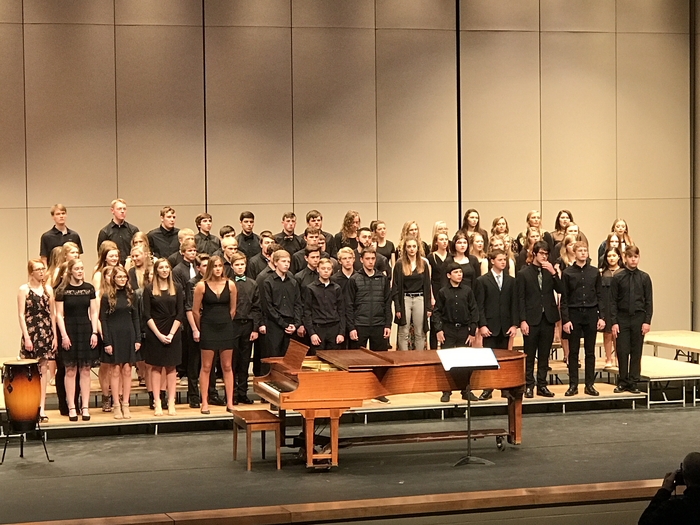 The 2018 SD All-State Chorus and Orchestra will be held on October 26-27 at the Rushmore Plaza Civic Center in Rapid City. 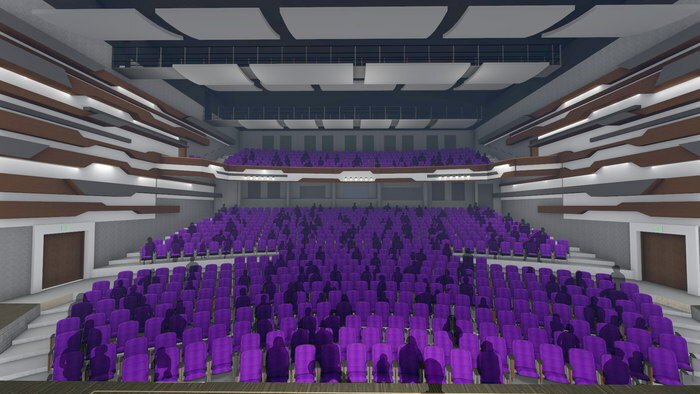 The Grand Concert will be at 7 pm MT on Saturday, October 27. The concert will be broadcast live on SDPB-1 TV at 8 pm CT / 7 pm MT on Saturday, October 27. The Watchdog VB Team is the #2 seed in Region 4A and they will host #7 seed Vermillion on Tues., Oct. 30 at 7:00. #3 seed Dakota Valley will host #6 seed Canton and #4 seed Lennox will host #5 seed Tea Area. EPJ is the #1 seed and they have a first round bye. GO WATCHDOGS! Just a reminder that Parent-Teacher Conferences will be held at each campus on Wednesday, October 24 from 4:00-6:00 p.m. and Thursday, October 25 from 4:30-8:30 p.m. There will be NO SCHOOL on Friday, October 26. Please come out and support the Volleyball Teams tonight in their final regular season matches prior to Regionals as the Watchdogs host the Quarriers from Dell Rapids at 5:00 p.m.! GO WATCHDOGS!! 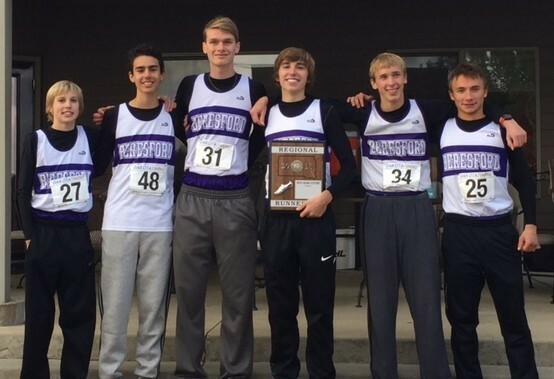 There will be a Welcome Home for our BHS XC Teams at 5:00 p.m. on Sunday, October 21 at Runner's Point! Runner's Point is located on the walking path between the Bridges Golf Course Clubhouse and the baseball field. 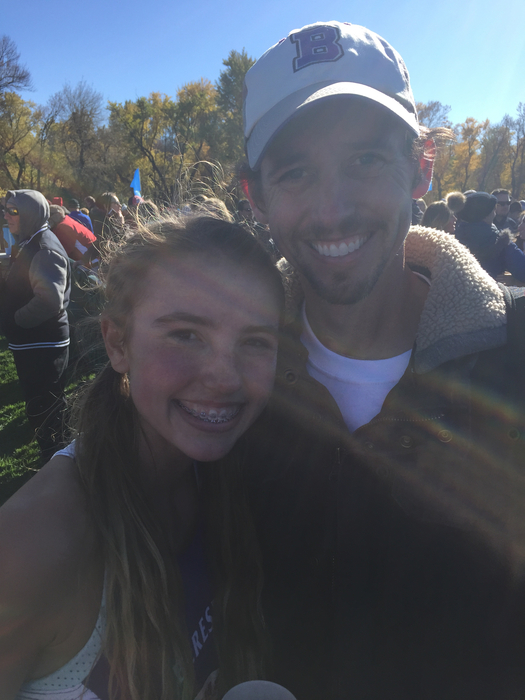 Congratulations to BHS freshman Anna Atwood who was the 22nd place state medalist at today's State A XC Meet in Sioux Falls. The Varsity Girls Team placed 11th. 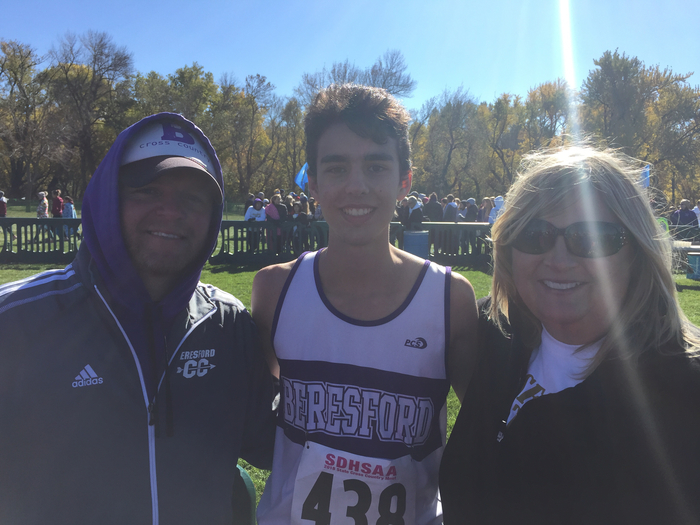 Congratulations to BHS sophomore Nico Sanz Curros on his 14th place state medalist honor today at the State A XC Meet! The Varsity Boys Team placed 5th! 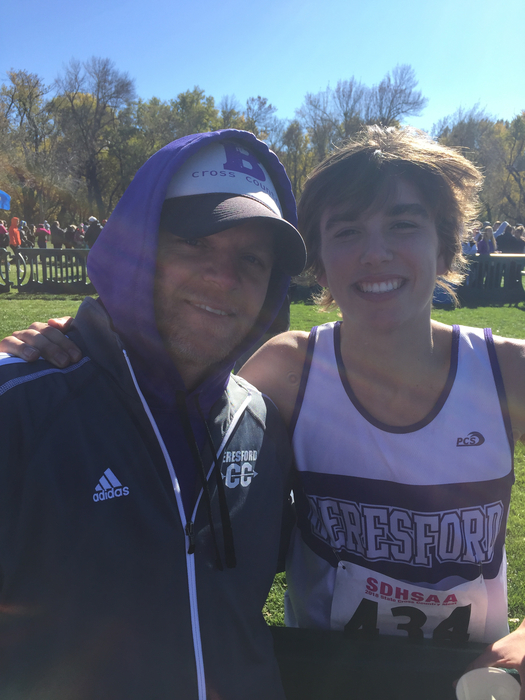 Congratulations to BHS senior Alec Atwood on winning the Class A Boys XC individual title in an awesome finish today at the State XC Meet held at Yankton Trails Park in Sioux Falls! 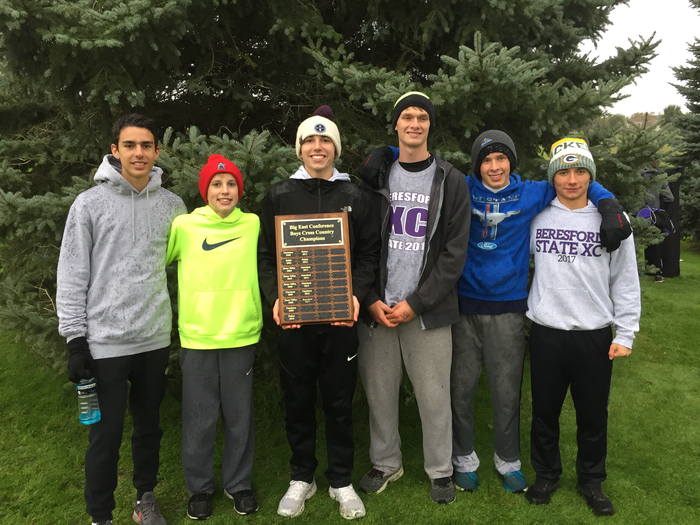 Good luck to our Varsity Girls and Varsity Boys XC Teams at the State Meet on Sat., Oct. 20 at Yankton Trails Park in SF! Gates will open at 10:30 and the meet begins at noon. Our boys will run at 12:30 and our girls will run at 2:00. Spectator guide link: http://5il.co/5blo. There will be a fall activities pep rally in the HS Gym today at 2:40 p.m. Parents and community members are welcome to attend. GO WATCHDOGS!! Good luck to the Watchdog Football Team tonight as they host the Sioux Falls Christian Chargers at 7:00 p.m. in the first round of the Class 11B State Playoffs! The tailgate will begin at 5:15 p.m. at the stadium picnic shelter. GO WATCHDOGS!! 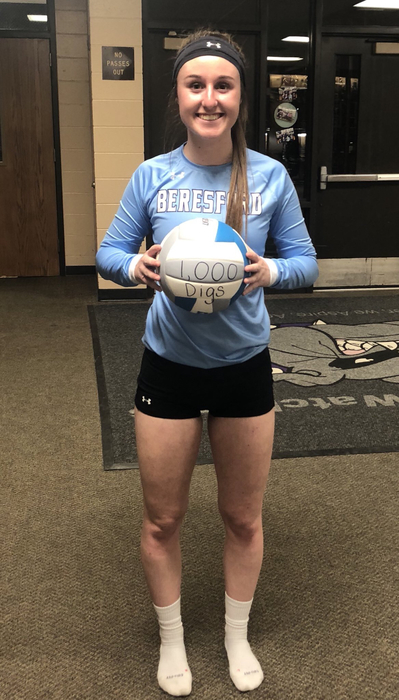 Congratulations to BHS senior Alana Bergland who had her 1000 career dig in last night's volleyball win over Vermillion!! BHS will be selling old FB jerseys for $20 at tonight’s VB matches. They can be worn at the VB match tonight, FB Playoff game on Thurs., and State XC on Sat. On Thursday, there will be a tailgate prior to the FB game including pulled pork sandwiches or smothered baked potato. For your convenience, please consider purchasing digital tickets to the football playoff game at https://gofan.co/app/events/37948. Adult tickets are $7 each and student tickets are $5 each. Convenience fees apply. Tickets may still be purchased at the gate. 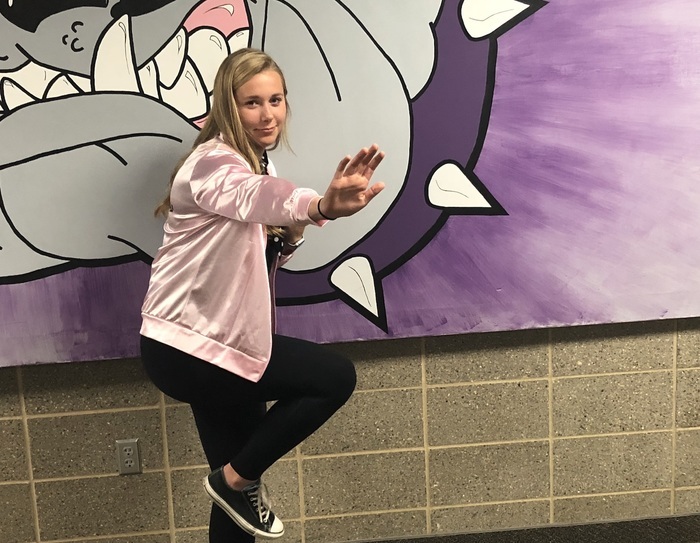 Come out and support the Watchdog Volleyball Teams as they host their final two regular season matches of the season on Tuesday, October 16 vs. Vermillion and Monday, October 22 vs. Dell Rapids. The Varsity has an 18-11 record. Go Watchdogs! Congratulations to the BHS Marching Band on their outstanding performance at the Sioux Valley Marching Festival on Friday, October 12! They placed 1st in Class A and had the top overall score out of 17 bands!! The Beresford Watchdogs football team will travel to Mt. Vernon/Plankinton tonight. The game will be played in Mt. Vernon. The game will be livestreamed at www.mvptitanslive.com. Go Watchdogs! Congratulations to the Varsity Girls XC Team on their 3rd place finish at the Region 3A Meet today in Lennox! 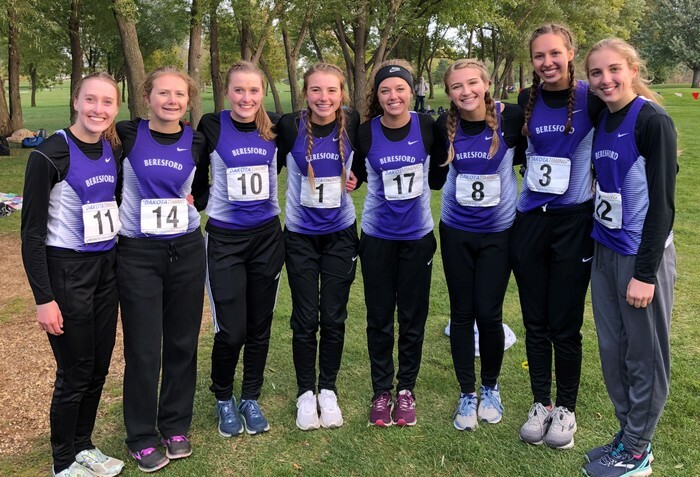 Four girls were medalists but our entire team has qualified to run at the State XC Meet in Sioux Falls at Yankton Trails Park on Saturday, October 20 at noon. Congratulations to the BHS Marching Band on their 1st place finish in the Class A division of the SF Festival of Bands on Saturday, October 6. They received 3 additional awards as well--People's Choice, Outstanding Percussion, and Outstanding Color Guard! Congratulations to the BHS Varsity Boys XC Team on winning the Big East Conference Championship today in Garretson with a perfect score of 10! Congratulations to the Varsity Girls XC Team on their 2nd place finish! 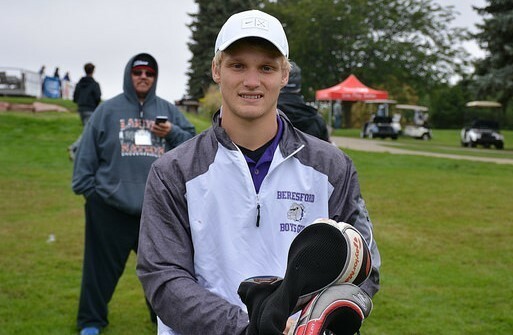 Congratulations to BHS junior Payton Borah on being a state medalist, placing 16th at the State "A" Boys Golf Tourney in Dell Rapids on October 1-2. Payton's 36-hole score was 169. Also congrats to sophomore Hayden Wilson who was a state qualifier. 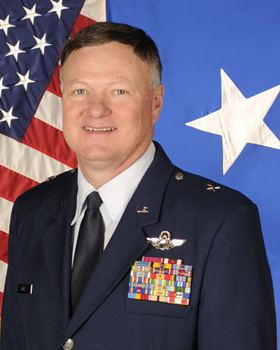 Photo courtesy of SDPB. The District's Bond Election voter turnout was 42.7%, 1044 cast ballots out of 2444 registered District voters. 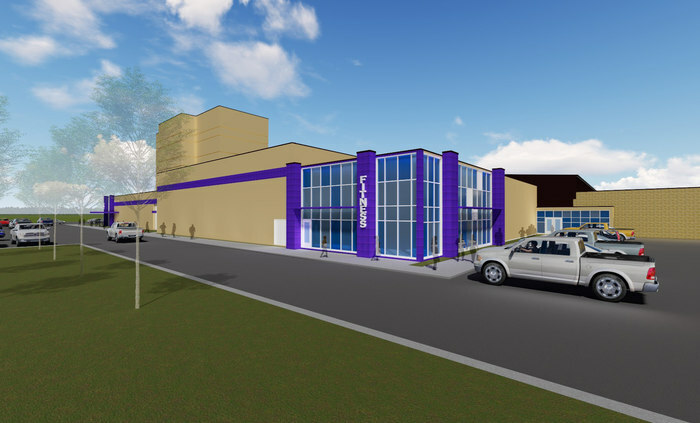 Beresford School District's Watchdog Legacy Project Bond was not passed by its District voters. There were 370 yes votes in favor of the bond (35%), 673 no votes against the bond (65%), and 1 unaccounted. The bond needed 60% to pass. 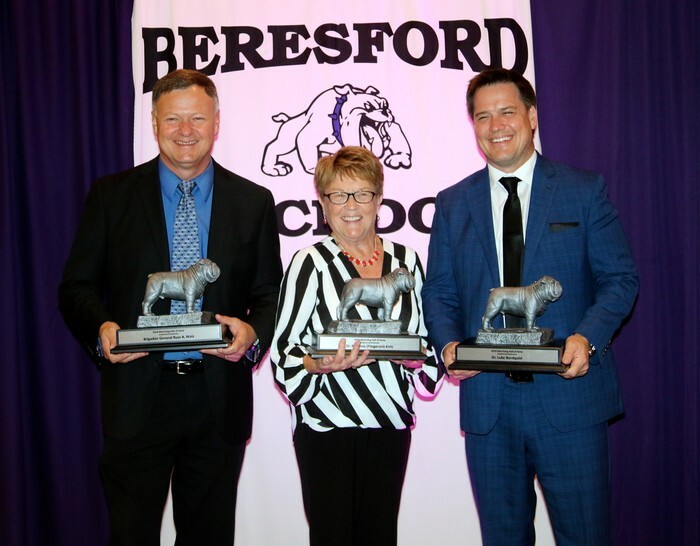 Congratulations to Dr. Rosanne (Fitzgerald) Kirts, Dr. Luke Nordquist, and Brigadier General Russ A. Walz on their induction into the Watchdog Hall of Fame Class of 2018. They were inducted into the Academics and Achievement pillar. Congratulations to Mr. Ted Heeren and Mr. Scott Latendresse on their induction into the Watchdog Hall of Fame Class of 2018. They were inducted into the Fine Arts pillar. Congratulations to Mrs. Sandra (Erickson) Carnes, Mr. Koln Knight, and Mr. Bob Young on their induction into the Watchdog Hall of Fame Class of 2018. They were inducted into the Athletics pillar. Congratulations to Dr. Helen (Kennedy) Grace on her induction into the Watchdog Hall of Fame Class of 2018. 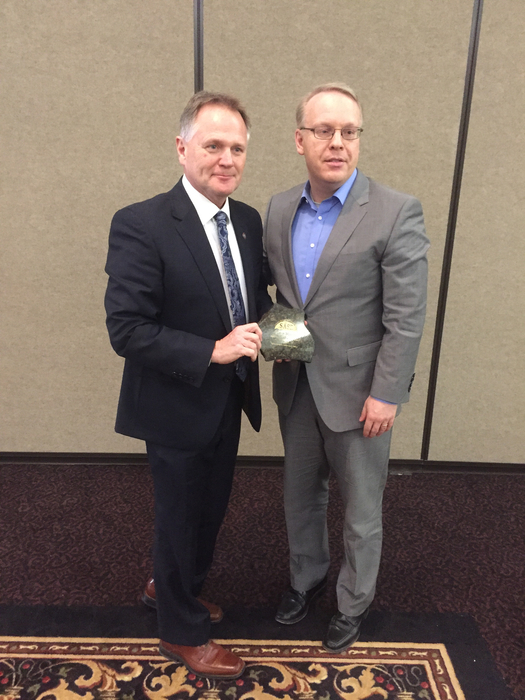 Dr. Grace was inducted into the Distinguished Service pillar. Accepting the award on her mom's behalf was Dr. Elizabeth Grace-Cruz. The traditional Watchdog Homecoming Parade will begin at 2:00 p.m. (please note the time change). All parade entries should lineup at Beresford High School in the parking lot or along Maple Street around 1:30 p.m. 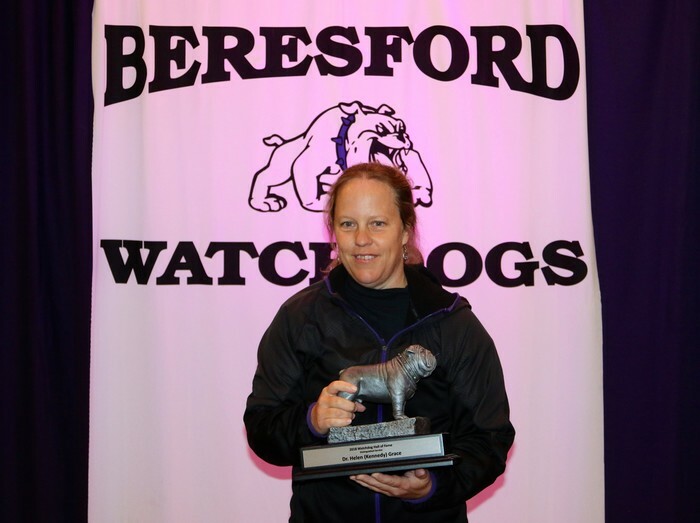 The 2nd Annual Watchdog Marching Festival will be held in downtown Beresford on Friday, Sept. 28 at 9:45 a.m. There will be 23 bands competing from SD and MN, along with the SDSU Pride of Dakotas Marching Band. Please come out and support the marching bands! The Watchdog Education Foundation will host a Homecoming/Community Pork Loin BBQ on Friday, September 28 from 5:00-7:00 p.m. at the Cortland Carnes Stadium picnic shelter prior to the Watchdogs football game vs. the EPJ Huskies. This is a free-will donation event. The Watchdog Legacy Project Bond Election is set for Tuesday, October 2nd from 7 am to 7 pm at the Beresford City Library. 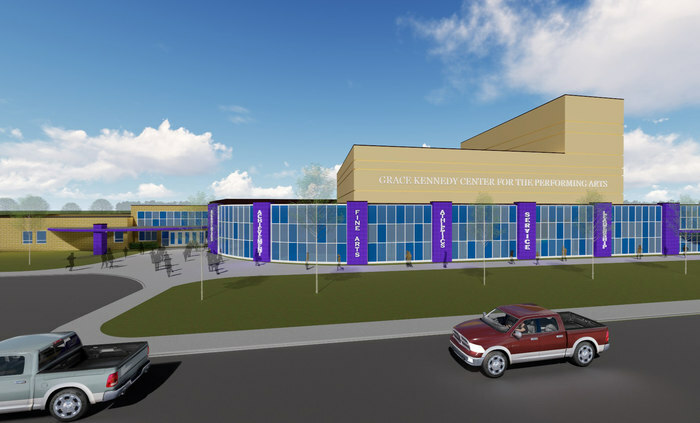 The project includes the Grace Kennedy Center for the Performing Arts, a Student Commons/Lobby, an Auxiliary Gym, and a Community-access Fitness Center. 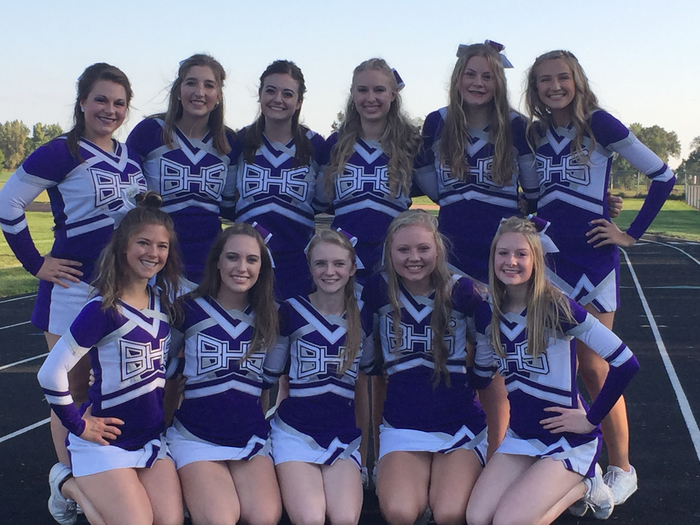 BHS Football Cheerleaders are ready to cheer on the Watchdogs vs. the C-Hawks from Canton. Go Watchdogs!! The FFA is sponsoring a tailgate this evening from 6:00-7:30 p.m. at the Cortland Carnes Stadium Picnic Shelter. They are grilling burgers and hot dogs. Proceeds will be used to support their attendance at the National FFA Convention. The Watchdogs play the C-Hawks from Canton. Do you want to know the details for homecoming week (9-24 through 9-29)? If so, check out this link: https://drive.google.com/open?id=1GdNdAnekZqNcaJ4TDQQHQ0eEAtzxp7IE. Good luck to the Watchdog FB team tonight as they travel to Groton Area to take on the Tigers. The game is being webcast at gdilive.com. Please use the following link: https://livestream.com/gdi. 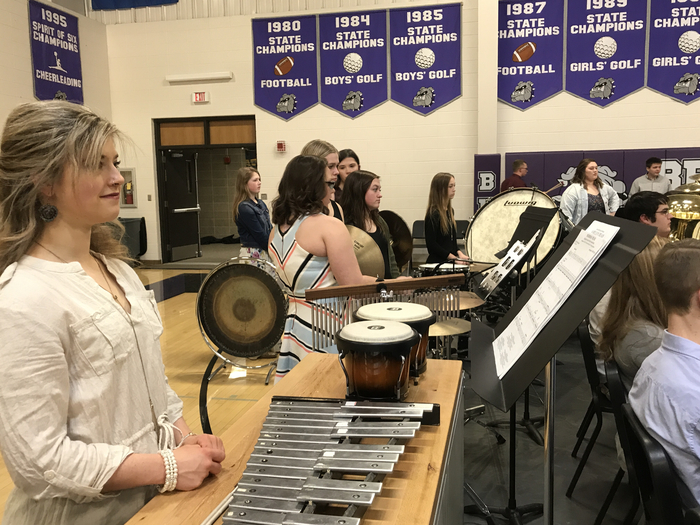 Beresford HS hosts the final day of the Big East Conf. VB Tourney on Sat., Sept. 8 at 2:00. Following is the schedule: 2:00-7th place (Garretson vs Flandreau); 3:30-5th place (Sioux Valley vs Baltic); 5:00-3rd place (Beresford vs Parker); & 6:30-1st place (Chester vs MCM). Due to a scheduling conflict with Dakota Valley, tonight's Volleyball game has been postponed and will be rescheduled at a later date. Please share, post, retweet, etc. 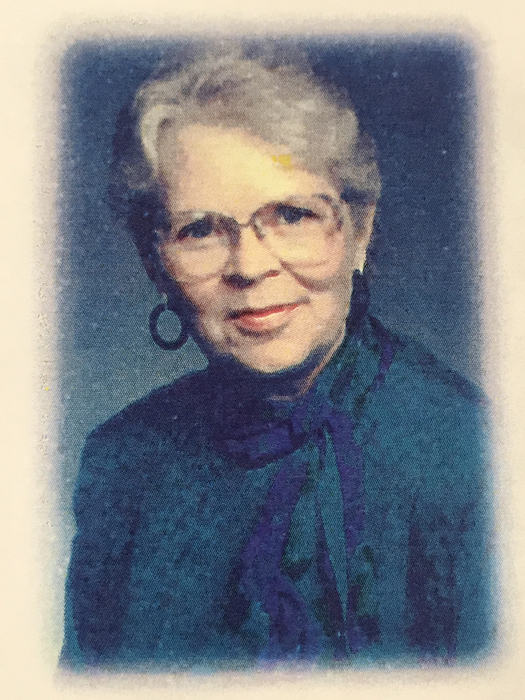 Congratulations to Dr. Helen (Kennedy) Grace who will be inducted into the 2018 Watchdog Hall of Fame in the Distinguished Service pillar on Saturday, September 29 at 6:00 p.m. at the Bridges. Congratulations to Mrs. Sandra (Erickson) Carnes, Mr. Koln Knight, and Mr. Bob Young who will be inducted into the 2018 Watchdog Hall of Fame in the Athletics pillar on Saturday, September 29 at 6:00 p.m. at the Bridges. Congratulations to Mr. Ted Heeren and Mr. Scott Latendresse who will be inducted into the 2018 Watchdog Hall of Fame in the Fine Arts pillar on Saturday, September 29 at 6:00 p.m. at the Bridges. Congratulations to Dr. Rosanne (Fitzgerald) Kirts, Dr. Luke Nordquist, and Brigadier General Russ A. Walz who will be inducted into the 2018 Watchdog Hall of Fame in the Academics/Achievement pillar on Saturday, September 29 at 6:00 p.m. at the Bridges. Please purchase your dinner tickets for the Watchdog Hall of Fame Banquet at the Bridges on Sat., Sept. 29. The dinner will be at 6:00 p.m. If you would like to purchase a ticket, please stop at the District office, call 605-763-4293, or email Rhonda.Peterson@k12.sd.us. Please come out and support the Watchdog Volleyball teams tonight in their first home matches as they take on the Bulldogs from Baltic. The Watchdog Varsity team is 4-2 on the season. NEON is tonight’s dress theme. Good luck to our Freshmen, JV, and Varsity VB teams! 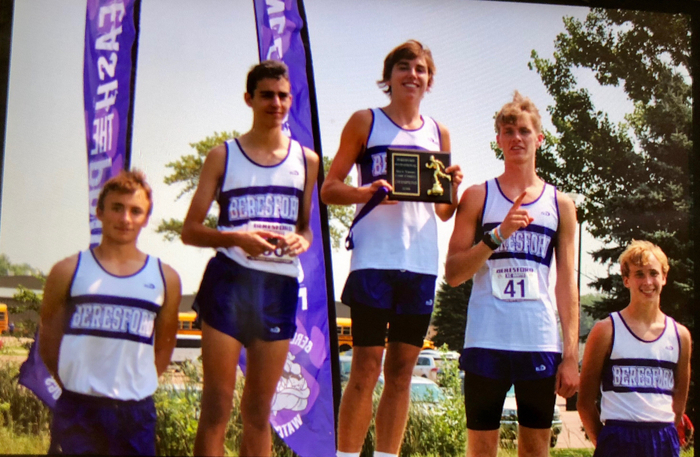 Congrats to the Varsity Boys XC Team on winning the Beresford Invite on Friday, August 24! Senior Alec Atwood was the individual champion! The Beresford School District would like to welcome its new staff members for the 2018-19 school year. 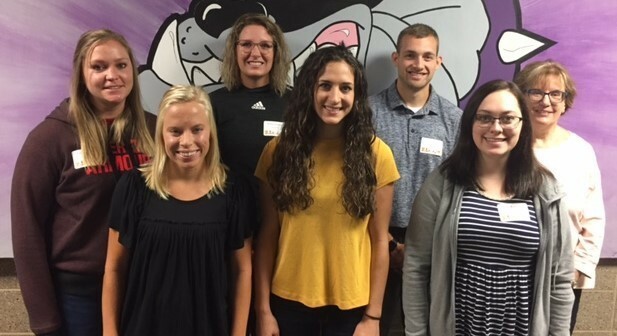 The Beresford School District would like to welcome 11 Co-Teacher Candidates from the University of South Dakota for the upcoming 2018-19 school year. 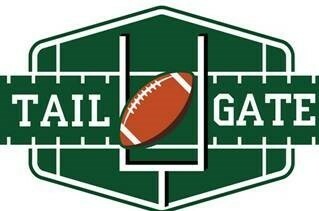 There will be a Tailgate prior to tonight's first football game from 5:00-7:00 p.m. at the stadium picnic shelter. Pulled pork sandwiches will be served by Jekyll & Hyde BBQ. The Beresford Watchdogs play the Bridgewater-Emery/Ethan Seahawks at 7:00 p.m. Go Watchdogs!! 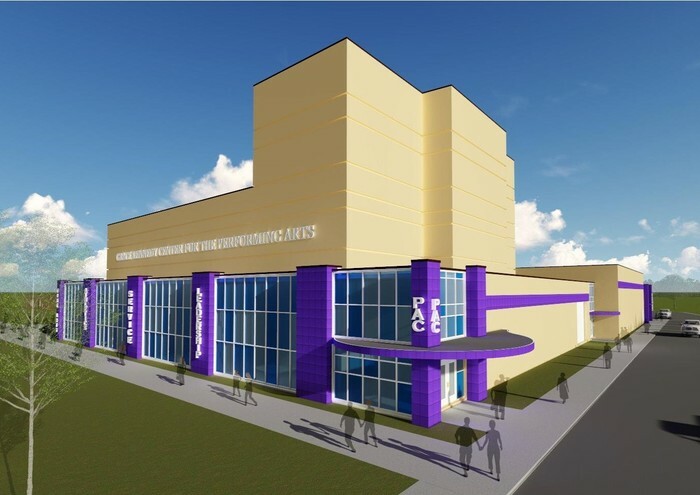 At their August 13 meeting, the Beresford School Board approved an $11 million bond resolution for the Watchdog Legacy Project—Grace Kennedy Center for the Performing Arts, Students Commons/Lobby, Auxiliary Gym, and Community-access Fitness Center. The bond election will be held on Tuesday, October 2 at the public library. On Monday, August 20 our District will host an Open House for students and parents from 5:30-7:00 p.m. at the Elementary School and 6:30-8:00 p.m. at the Middle/High School. Sixth grade parents and students -Join us on Thursday night (8-16) at 6:30 p.m. (choir room) to kickoff the year! Sophomores, Juniors, and Seniors -Join us on Thursday (8-16) and Friday (8-17) when your schedule allows from 8:00-3:30 to get your iPad (make sure online forms are done), make schedule adjustments, and pay your $5 student fee. Ninth grade parents, students, and new high school students and parents -Join us on Thursday night (8-16) at 7:30 p.m. (choir room) to kickoff the year, talk about BHS, and to get your iPad set-up. Parents, please be sure to complete our online forms prior to the meeting. 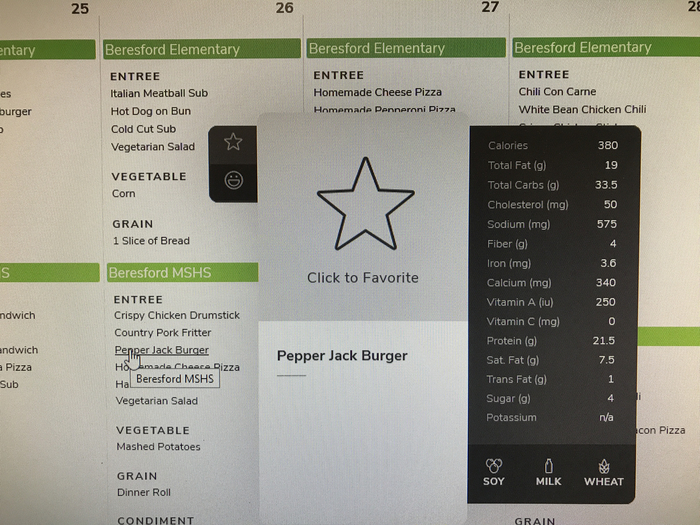 Infinite Campus Parent Portal Users - Applications for free or reduced meals can now be completed online. Select Applications/Forms on the Portal. Call 763-4293 if you have questions or need help. Boys’ Golf will meet in the HS Library with Coach Flemmer on Monday, August 6 at 5:00 p.m., followed by the parent meeting at 6:30 p.m.
Our FB, VB, and XC coaches will host their annual meeting for student-athletes and parents on Tuesday, August 7 at 7:00 pm in the BHS Gym. Our District's new mobile app is available for download on iPhone or Android devices. Search for Beresford K12. As a District, it is our desire to communicate important and pertinent information that is timely and relevant to what is taking place in our schools. Our District's intent was to build a mobile app that focuses on what really matters: the user experience. It is our hope that parents and community will use the app for meaningful information. 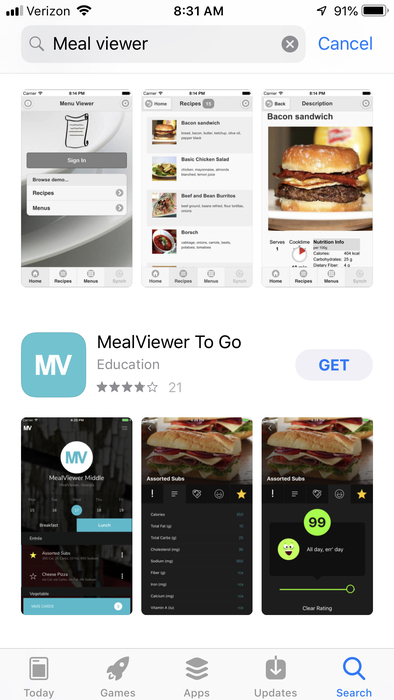 We are very excited to rollout our District's new mobile platform through Apptegy, which will allow us to manage all of our communications from a single place.